In March of 2014, a dream of Pastors Salomón and Mariela as well as Vida Abundante (Abundant Life) church members began to unfold. The Pastors’ vision was to acquire land to develop a permanent multi-purpose facility to serve the community. 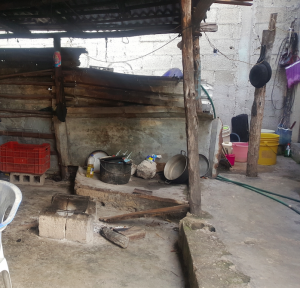 They targeted their search in the Emiliano Zapata neighborhood, one of Cozumel’s areas of greatest need (high incidence of family issues including addictions, economic need, suicide, violence, etc.). A property in the heart of the neighborhood became for sale. It had a couple of rooms in need of repair that could become a home for the pastors’ family, some partial construction and enough space to construct a center. It is more than a church. 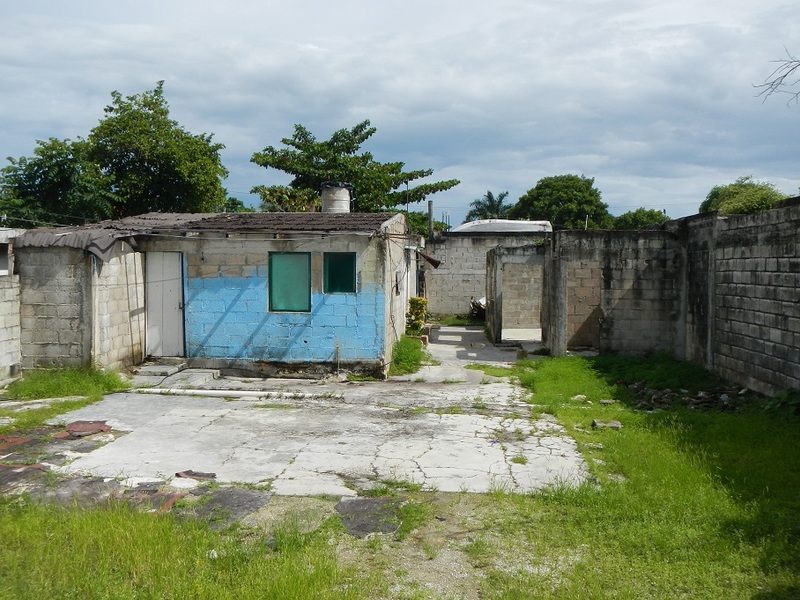 The goal is to construct a building over time for worship services and youth activities that serves the broader community as an educational center and refuge for hurricanes and other community needs. Both pastors recently completed a year of intensive training to become certified as international chaplains to lead community projects and serve as first responders for natural disasters, including travel to other areas of Mexico as well as other countries including the US. Significant fundraising efforts by members and generous donors led to signing a purchase agreement and the land was fully paid for in 9 months! 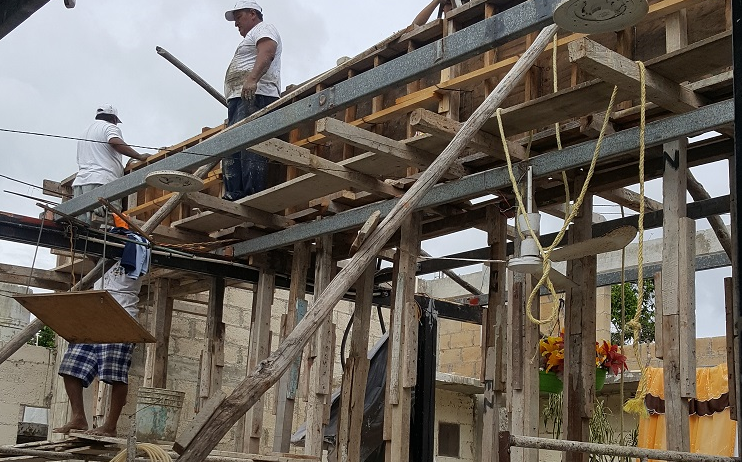 Over the next two years (2015-2016) improvements included: roof repairs and modifications for the pastors’ family rooms; roofs installed over two partially constructed rooms and an additional space to make small classrooms, bathrooms and a storage area. 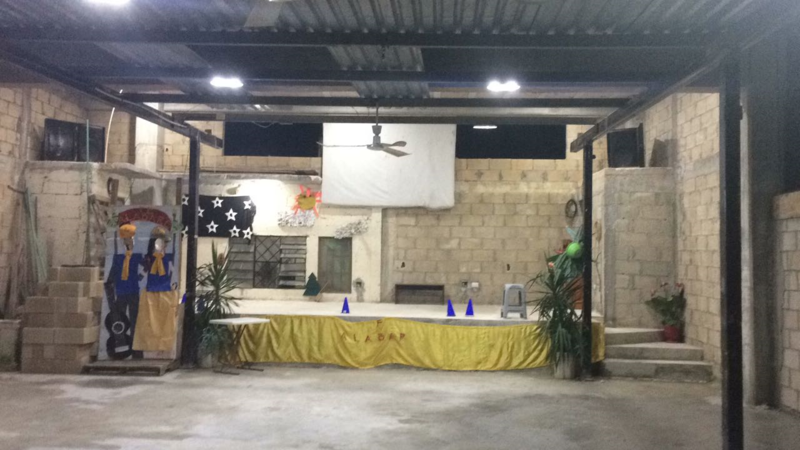 During these two years, worship services, educational activities and community events were held under the same tin roof that was donated in 2010 and moved from previous temporary locations. 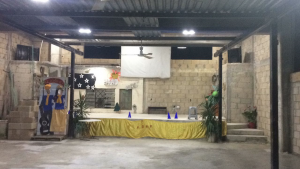 The biggest challenge with the tin roof open air structure is that anytime there are significant rains accompanied by wind, worship services and other activities have to be cancelled. It is extremely hot in the afternoon sun and there is no protection from mosquitos. 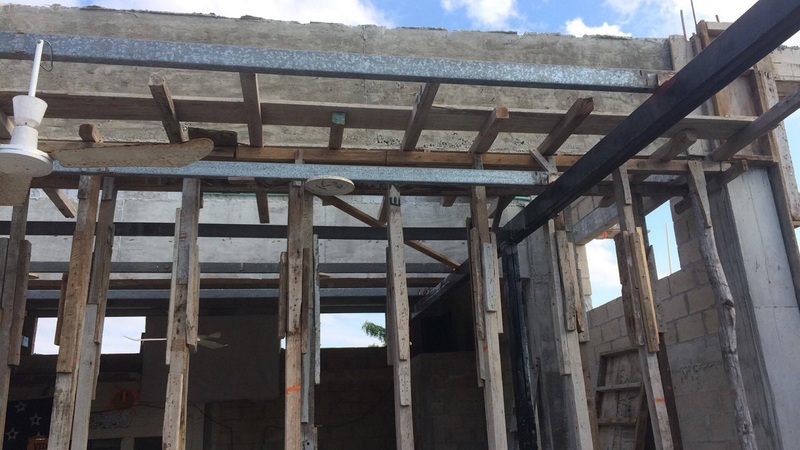 An architect hired in December 2015 developed a plan to maximize the space available, ensure construction complies with local requirements, is handicap accessible and to provide cost estimates. It may take a number of years to raise sufficient funds for the entire construction project so it was decided to build in phases as funds become available. This “build as you can pay” approach is typical for local families, organizations and businesses. Nov. 2017 – Phase 2 Walls, support beam, roof and electrical installation completed allowing space to hold worship services. A “bodega” to store tables and chairs built beside altar. Begin phase 3—Construct north side wall. Dec. 2017 – Gather cost estimates for next steps. Meet with architect and engineer to discuss modifications to original plan to accommodate kitchen and bathroom needs for building to serve as community hurricane refuge center and facilitate educational events. Jan. – Jun. 2018 Launch fundraising campaign; cornerstone dedication with key donors and church members; finalize plan modifications and funding needs. Continue Phase 3 as funds are available to construct south side wall, column, back wall/façade that faces street, and roof section. Phase 4 Install windows and doors to fully enclose the structure. Interior and exterior finishing – As you see from the photos, the walls are rough cement block. Two coats of cement will need to be applied on the exterior and interior by hand to create a smooth surface to be painted. This is a lengthy, labor intensive process. Tile or some type of flooring will be installed over the cement floor to provide a smooth surface that can be easily cleaned. The total floor space will be approximately 1,100 square feet. 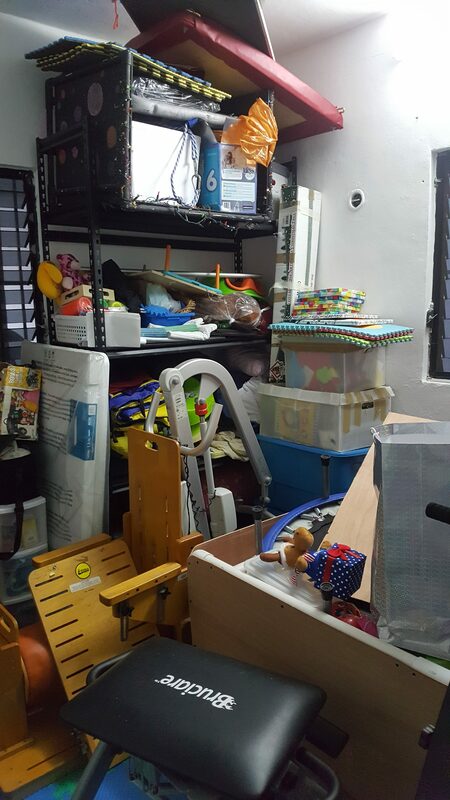 Other needs include: Shelving and storage cabinets, chairs and additional tables, sound system, projector and screen, health and safety equipment (signs, first aid supplies, fire extinguishers), etc. 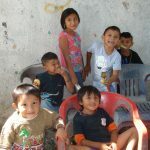 Transforming the dream to reality is a HUGE challenge for a small congregation of families that have very limited resources. In addition to the financial aspects of the building project, the time invested to plan and supervise the construction in the absence of having a general contractor, finding available building materials, weather, and having to start/stop building as funds, materials and workers are available complicates the process. The pastors and members are thrilled with the progress that’s taken place to date. 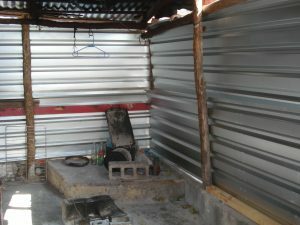 Thanks to several individual donors and organizations like Volunteer Christian Builders who have contributed funds along with members’ fundraising efforts for Phases 1 and 2, Vida Abundante now has a small space protected from rain to worship for the holidays. The space will expand as phases are completed. 2018 presents new opportunities to continue serving the community while building the church. This entry was posted in Uncategorized on November 27, 2017 by pedersenll. 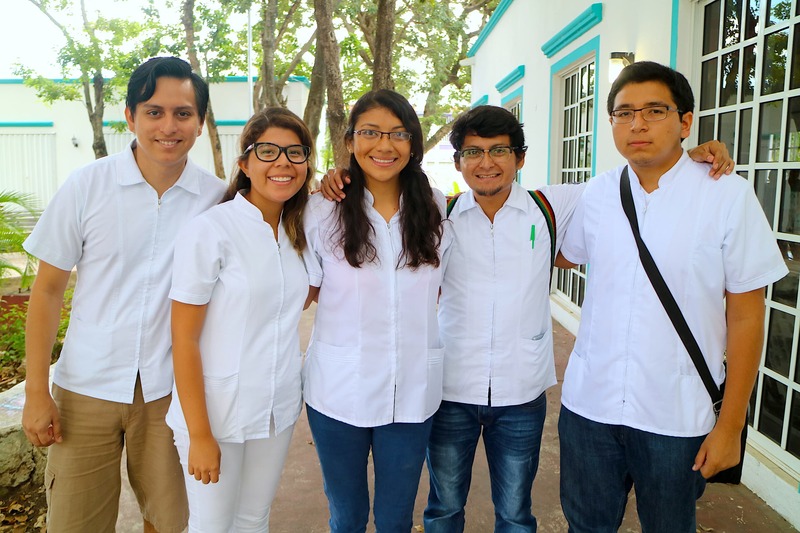 A high school education is not the norm nor taken for granted in Cozumel. However, it enables learning trade skills and gaining further education that results in greater job opportunities and helping families become self-sufficient. Lack of financial resources is the biggest obstacle for students continuing their education to high school or beyond. The “inscripción” (registration/tuition fees) for public high schools and the local university is approximately 1,300 pesos (~$80 USD) per semester plus weekly or monthly school related expenses depending on the area of study. Of course, private schools and some public university programs are more expensive. 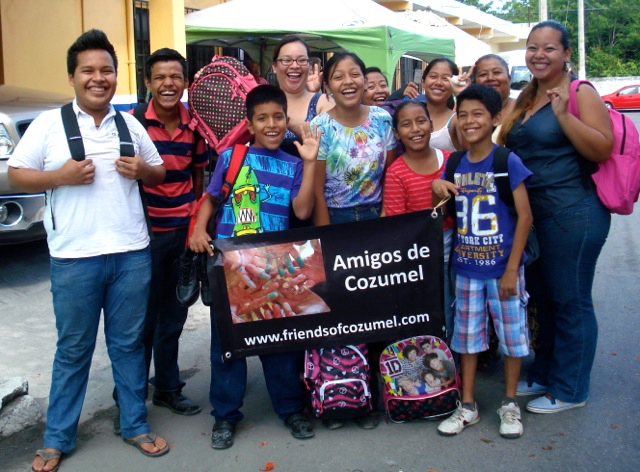 Friends of Cozumel (FOC) began a scholarship program several years ago funded by private donors who sponsor one or more students. We dedicate at least 50% of the earnings from each Gran Bazar to scholarships. Scholarships are available to high school and university students as well as young people or adults who want to study English or specific trade skills. 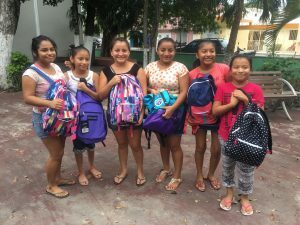 All recipients are from Cozumel families with limited resources; have to demonstrate academic achievement; and each student volunteers to give back to the community. Meet a few of our scholarship recipients below; 75% of the 24 are high school students; 25% are university students. We anticipate adding learners to study English or special trade skills in the coming months. Guadalupe (left) and Dulce (right) were grateful to volunteer with us during our distribution of school supplies. Sisters Dulce and Guadalupe are high school students FOC identified to receive Chrysalis scholarships for first semester tuition and uniforms. Like other high school scholarship recipients, they will be eligible to receive FOC partial scholarships (50%-80% of tuition) for second semester if they maintain a grade point average greater than 7 of 10. Their family includes two younger siblings, mother with a rare blood disease that impacts her ability to work consistently and father who works as a cement laborer but sometimes struggles with alcoholism. 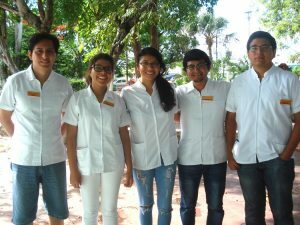 Nuria (center) with the medical team from UADY that participated in our Summer ’17 mission. Nuria is a 5th year medical student at UADY in Merida. She is bilingual and has been an FOC volunteer for years. Nuria led a team of med students to provide a health fair including screening for diabetes in July. Other university scholarship recipients are studying business administration, interior design, veterinary medicine and marketing. Blanca graduated from high school in July 2017 with a major in Food and Beverages along with her “novio” (boyfriend), Edwin, who majored in Human Resources. They are the first from their extended families to complete high school and are looking forward to continuing their education at a university. 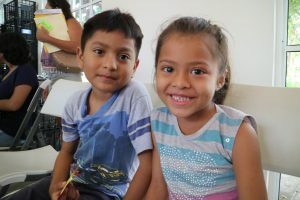 Both are working for a year to save money for university, caring for Blanca’s grandmother, Antonia, who will be having an operation in the coming months and they plan to take English classes at a local technical school. Alex, a former FOC scholarship recipient, also graduated with a major in food and beverages, studied English for a year while working and now has an excellent job at Coral Princess resort. He has received special training under the chef and is now doing a rotation working in the beverage side of the business. This entry was posted in Uncategorized on November 10, 2017 by pedersenll. What would your life be like if you didn’t have access to technology? Where “friend” relationships were based primarily on face-to-face conversations and information spread primarily by word of mouth? It is hard to imagine not having technology for personal communication, work or school. 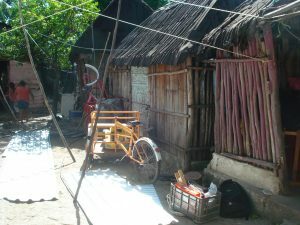 Yet that is the challenge local Mexican families with limited resources face. 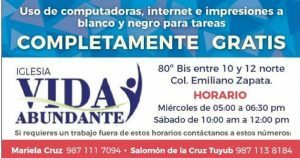 Students in secundaria (middle school), prepa (high school) and university all have homework and special projects that require technology. USB drives are required school supplies. Few students have access to the internet or tablets/laptops in their homes. School technology resources often don’t work or are limited to school hours. Internet cafes are an option but many families can’t pay the fees. Neighborhood parks offer free wifi but students need their own devices and must be comfortable with their personal safety in a public place often after dark. Last year FOC initiated a pilot project in collaboration with Vida Abundante Church to open a small drop-in center for homework. FOC purchased four laptops. A local computer tech volunteers to configure the laptops, run updates and install online security. The church provides a classroom with locks to secure the laptops, free internet access, printing and someone to monitor use. Beginning this month the project is being promoted more broadly with two set times and other days by appointment. Individuals and teams of students now have a safe place to work together on school projects where they can concentrate on their homework and has free access to wifi, laptops and printing. Adults may also use the laptops for online investigation for their own learning. 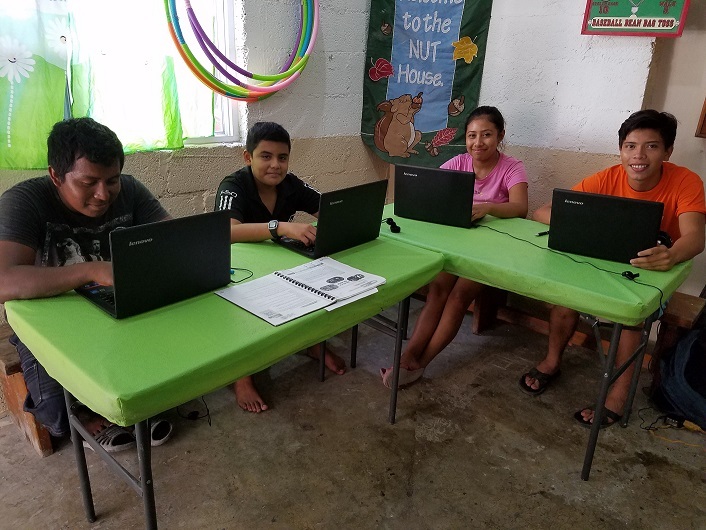 Interested in supporting education through technology to benefit Cozumel youth? 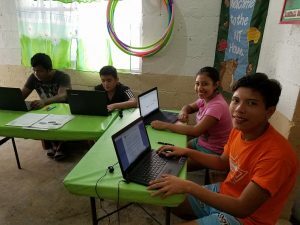 Approximately 200 usb drives (any size) are needed by July 2018 for our school supply distribution to Cozumel students. They can be ordered in quantity (5, 10 or more) online for approximately $4 USD each. Local cost is more than double so it takes one or two days wages for a parent to purchase. We’re looking for donations of usb drives (used ones are fine if contents are cleaned off). Another option is to volunteer to transport usb drives (they are small and lightweight) if you are coming to Cozumel via cruise ship or plane. We can order and pay for usb drives with FOC donor funds to drop ship to your location to bring. If you are coming to Cozumel and are willing to donate or transport usb drives, contact us via email pedersenll@hotmail.com or Facebook private message. This entry was posted in Uncategorized on November 1, 2017 by pedersenll. 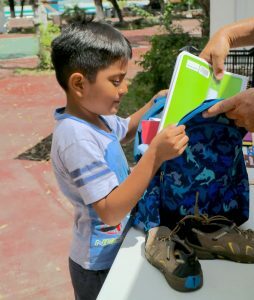 We’re often asked “What school supplies are needed?” Our goal for 2018 is to provide 500 students with backpacks, supplies and athletic shoes. 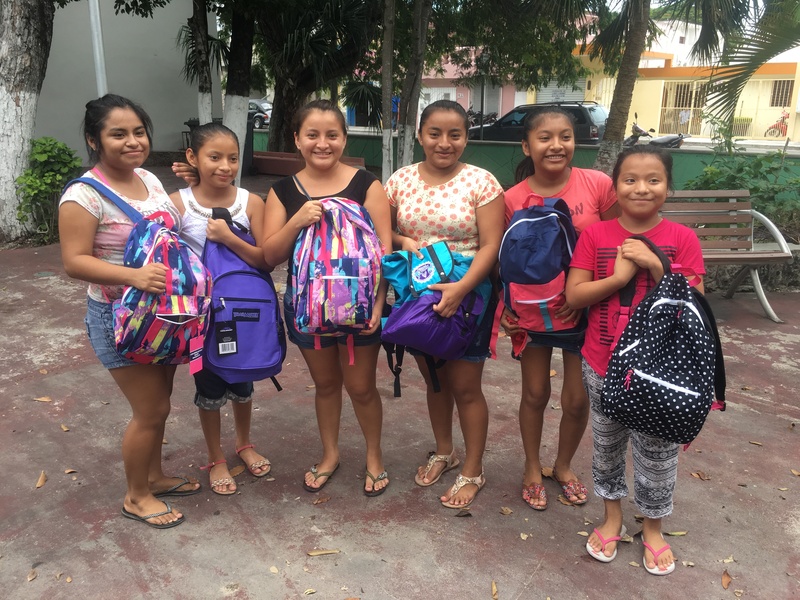 Extra donations will be used to expand our list or for “basic school supply packets” like the 175 additional students we benefitted this past summer who may not be on our Friends of Cozumel school distribution list. 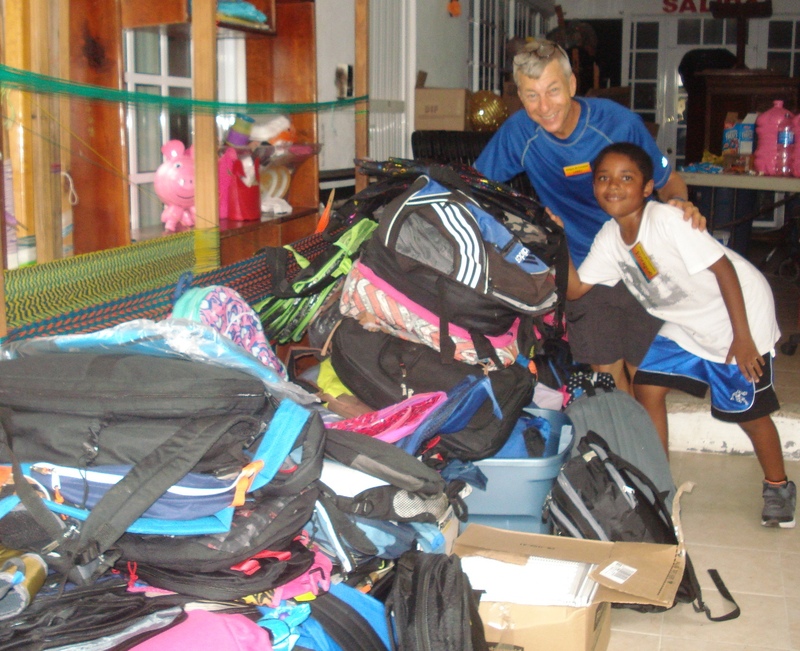 As of Oct 23 we have 185 backpacks on hand – 315 more to go! Here are the 10 highest priority needs for the next 8 months November – June. We will update this list throughout the year as we receive donations. Athletic shoes boys’ and girls’ youth sizes 10 through adult men’s and women’s size 10. Youth sizes needed begin size 10-13 then the numbers change to 1-5 that bridges into adult sizes. Youth size shoes 10-5 can be any color. Adult sizes 5-10 are needed in primarily white (small accent color OK). Male students can use adult sizes 5-10 in white or black (doubles as required black school uniform shoes). Other back to school basics if you see a good deal: No. 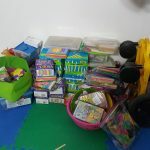 2 lead pencils; glue sticks; crayons-24 count; scissors (blunt or point ends); USB drives of any size; 1” 3-ring binders for university students; toddler size shoes less than youth size 10. Boys’ and girls’ socks and underwear are given to selected students. Volunteer Ilene (left) earned a smile by fitting this student in sparkly shoes. These girls are thrilled that they have the necessary supplies to attend school. Now in the fall is the best time to find backpacks at reduced prices in discount stores like Walmart and drugstores (Walgreens, CVS) because they clear out school inventory to feature holiday items. Talk to the manager and offer $2 or $3 each for backpacks. Walmart frequently has sales on athletic shoes for $3-$5. Dollar stores are great sources to find basic and scientific calculators. Check to ensure the batteries work. Some dollar stores and Big Lots have Spanish-English dictionaries for $1-$3. Check the sales bins of office supply stores for close-out deals. Menards and some farm supply stores also carry school supplies and offer end of the season closeouts. Online shoppers . . . There are great deals out there for buying in quantity. For example, we can order a case of 24 good quality backpacks for approximately $3-$4 each to drop ship to any US location. No shipping costs for Amazon prime members. Approximately 7-8 backpacks fit inside each other with the outside one zipped. So 3 or 4 cruisers could easily each bring one backpack full of other backpacks off a ship to deliver a case of 24 backpacks. Dollartree.com is an easy way to purchase a box of 24 basic calculators for $24 or the scientific calculators for $1 ea (min. of 4), a box of highlighters or dry erase markers. USB drives are another great online deal when purchased in quantity and take up little space to transport. If you are flying to Cozumel, BE SURE TO KEEP YOUR RECEIPTS and have them handy when you arrive to show Customs officials if requested. This entry was posted in Uncategorized on October 25, 2017 by pedersenll. Muchas Gracias . . . Many thanks to all our Friends of Cozumel (FOC) donors. This truly was a record breaking year for amount of supplies and monetary donations received. As a result, the project benefitted significantly more students. Back to School Update . . . Cozumel students in kindergarten through high school have completed the first two months of school and are receiving mid-term grades. University students studying here on the island as well as students attending universities in other Mexico locations have different school calendars. Scholarship recipients are sending in their first term grades to be eligible for continuation of their scholarships so the school project continues throughout the year and we’re gearing up for 2018. Record results of 680 students benefitted . 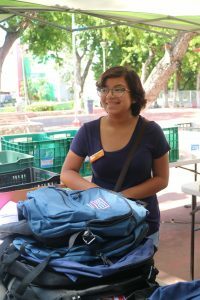 . . 505 students received backpacks with school supplies for their specific year in school. All are from families in need and must provide documentation showing each student’s grades or proof of school enrollment. We collaborate with Chrysalis and other organizations that benefit a specific list of pre-identified students to eliminate duplication of resources. 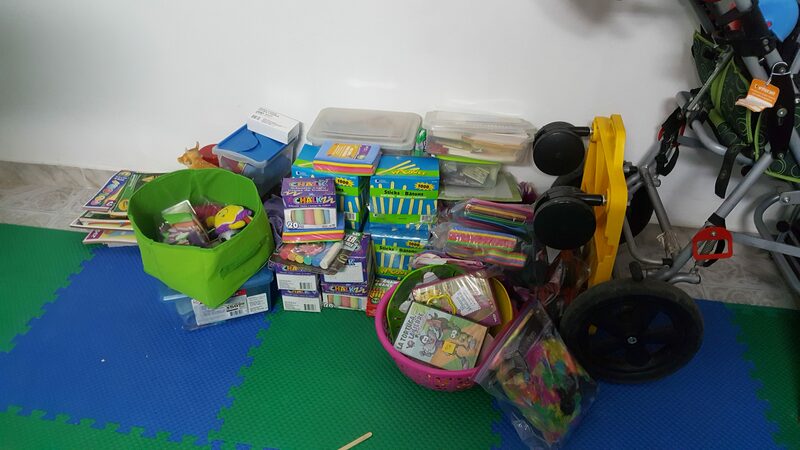 In addition, FOC provided 175 basic school supply packets to youth served by DIF (local social service agency) and a shelter program for women who have been abused and their children. 30 CAM (2 schools for special needs youth with various disabilities). Years ago, when we began the school supply project, most students were in primaria (elementary school). We’ve seen a dramatic shift to secundaria, prepa and university. Another trend is the changing balance of males vs. females in school and profile of who continues beyond the obligatory school attendance age of 14. In the past we experienced female students dropping out of school earlier than males. In 2017 FOC served 46% males and 54% females. The breakdown for high school is 45% males; 55% females and for university 18% males vs. 82% females. Coming Soon . . . Check back for postings how volunteers can participate in the school project, highest priority school supply and shoe donations needed for 2018, scholarship program and other community service/mission projects. This entry was posted in Uncategorized on October 18, 2017 by pedersenll. Sarah (right) is a first-time FOC volunteer. Friends of Cozumel is fortunate to have volunteers who come to our mission weeks from many directions. 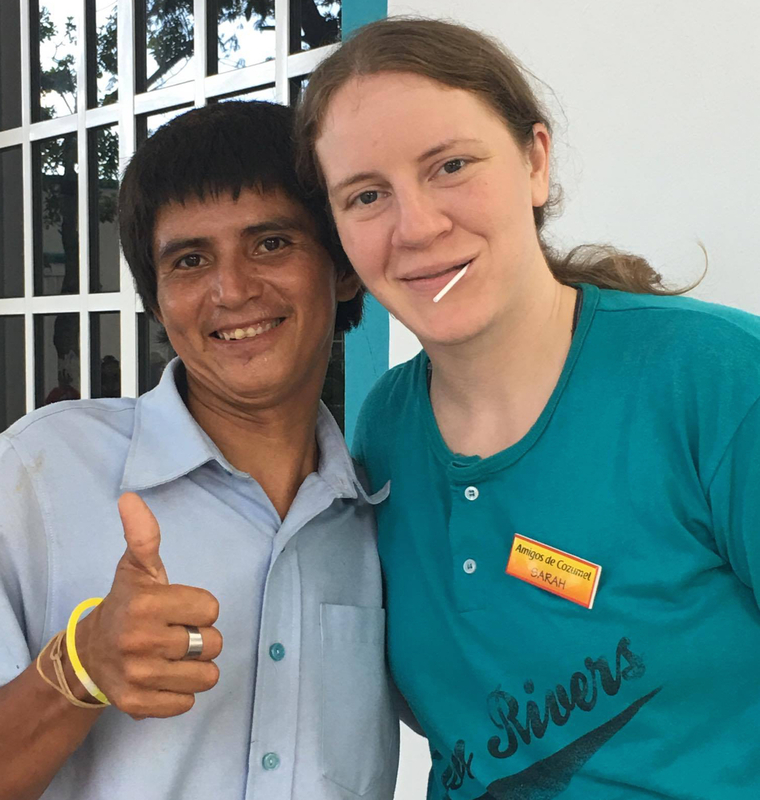 Some simply want to connect with local people and help where they can. Others have faith-based interests and seek out church connections. Here’s the perspective of Sarah, a new volunteer from Maryland. 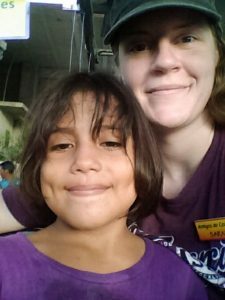 Volunteering in Cozumel has been a life-changing experience. 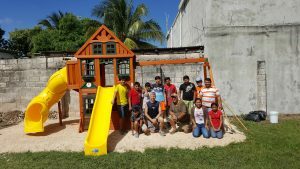 I came here with the CREW Project to serve two local churches and to partner with Friends of Cozumel on various projects. This is my first mission trip and I am grateful for the experience and for the people I’ve met. 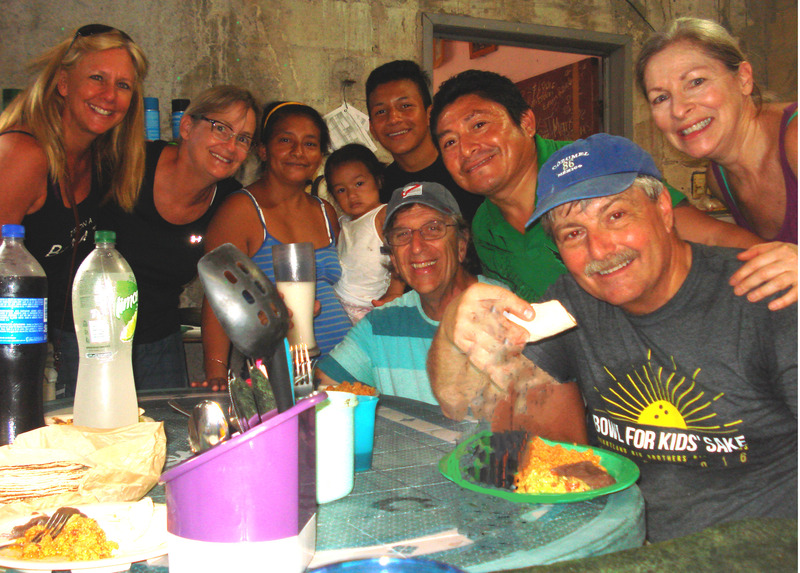 Sarah (back, center) and the CREW team enjoy a meal with the pastors of Vida Abundante and their family. Initially I wasn’t very excited about the church activities. I guess I thought I didn’t have anything to offer but entertaining with games and pizza parties. But as I reflect on those events, I am reminded of a very important lesson that I learned many years ago: don’t overlook the being for the doing. As North Americans, we lose sight of the things that really matter while chasing the latest technology or the newest shiny things. 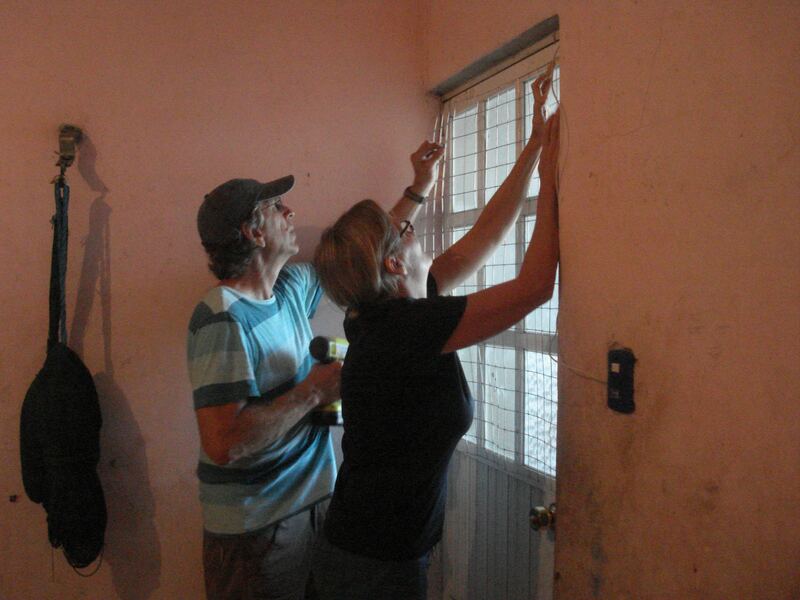 As Christians in the mission field, we get hung up on serving and providing and doing. As people, we focus on completing our checklists and getting things accomplished. We stay so busy doing things that we forget to be. We don’t realize that our time and presence with others is what sustains us as humans. It is great to do things for others and for God, but we need to make it a priority to spend time being with God and our loved ones. This is the message that the CREW Project shared at Vida Abundante Church here on the island. We provided a visual display with objects in a jar that represented very important, somewhat important, and trivial things in our lives. When we fill the jar of life with the little things, giving those trivialities our first time and attention, there isn’t enough room to fit in the really important things. However, when we start with the big, meaningful things, it doesn’t matter if all the small things fit. Pastors Salomon and Mariela of Vida Abundante felt blessed with the lesson and said the visuals made the message easier to understand. “The organization of the materials presented was great,” Pastora Mariela said. 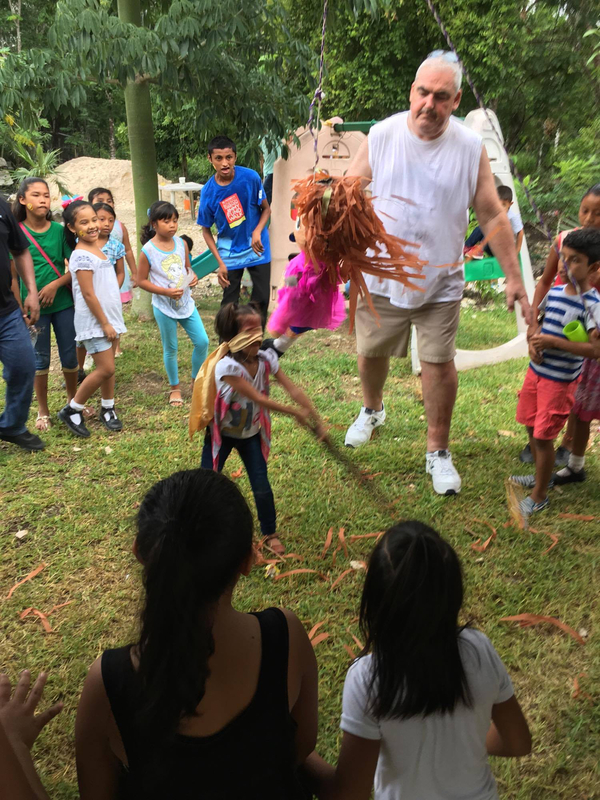 There’s nothing like a pinata party to make new friends at Casa Oración. 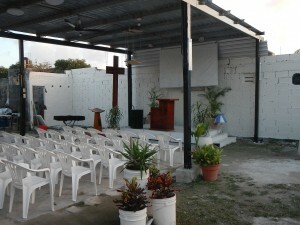 We also worked with Casa Oración, the jungle church as we call it, outside of Cozumel’s main community. Both churches are excellent examples of hospitality. My team could have shown up with empty hands and empty pockets and would have been welcomed just as warmly. It seems to me that our presence here was the gift. I believe an equal exchange took place between the Crew Project and these churches. We provided financial and material resources. In return, we were offered the simplicity of worship of our Creator and the goodness of fellowship and unconditional love. The love of Jesus Christ surpasses race, language, and geography. 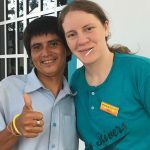 The language barrier made communication difficult but I was personally able to bond with the children and adults over water balloons and photo props. 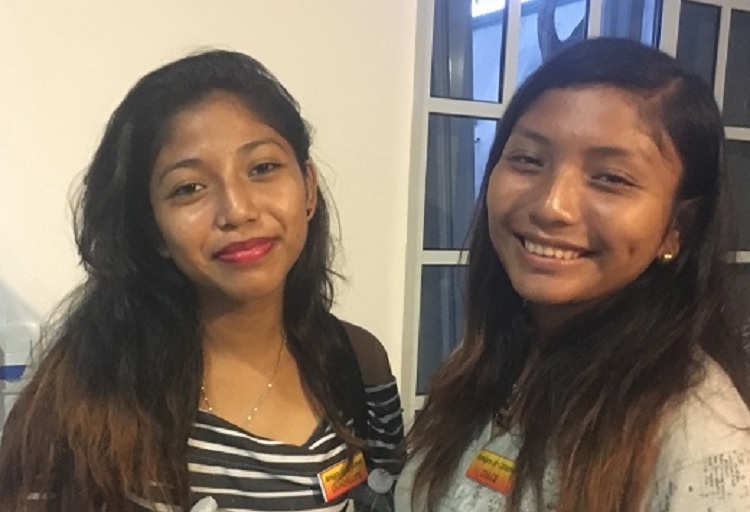 Alondra (left) and Sarah became fast friends. 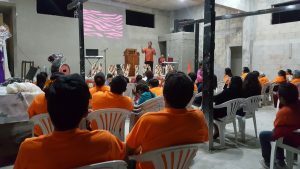 The theme of the vacation Bible school at Casa Oración was praising God at all times. It was very fitting for us as visitors. Could we praise God in a church without air conditioning in Cozumel’s extreme heat? Could we praise Him with aching feet and sweat running all over? The answer was yes. We sang and danced and filled that place with praise. Both of the churches we visited were filled with more love and genuine praise than most U.S. churches. It was refreshing to get a break from the cushiness, flash and politics of church at home. It’s not about the building but about the community; it’s about living out the love of Christ. This entry was posted in Uncategorized on August 3, 2017 by pedersenll. The shoe team of volunteers was ready and waiting when hundreds of students arrived. At the start of the day, we had a lot of shoes. Think high-tops, tiny Ninja Turtle themed shoes, pink canvas shoes with glitter, basic white runners—more than 500 pairs of them. They all came from generous donors who want kids in Cozumel to be able to go to school. By the end of the first day of distribution, the stockpile was greatly diminished. Nearly a third of the 495 registered students had been fit with new shoes for school. 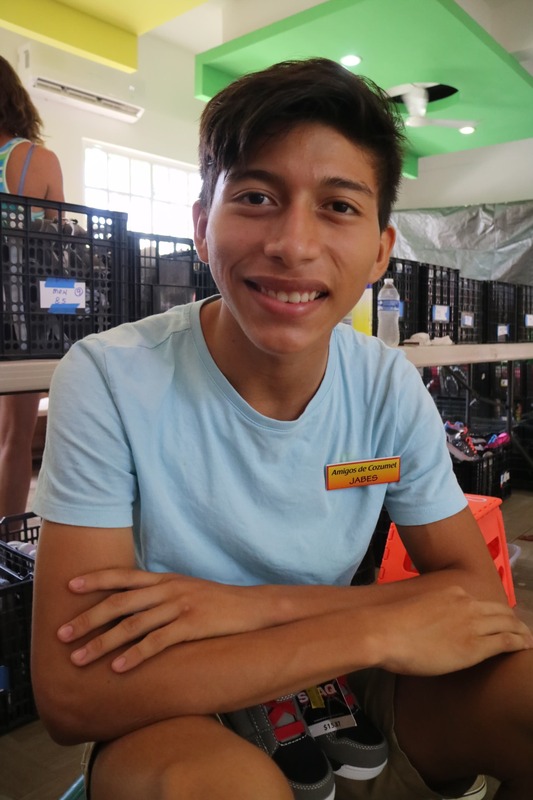 Volunteer shoe-fitters took a breath then began to reorganize supplies for the next group of students hoping to find the athletic shoes required for them to attend school. Students receiving shoes included those from kindergarten age to university level. Even their youngest, barefoot siblings were fit with tiny toddler shoes or sandals. 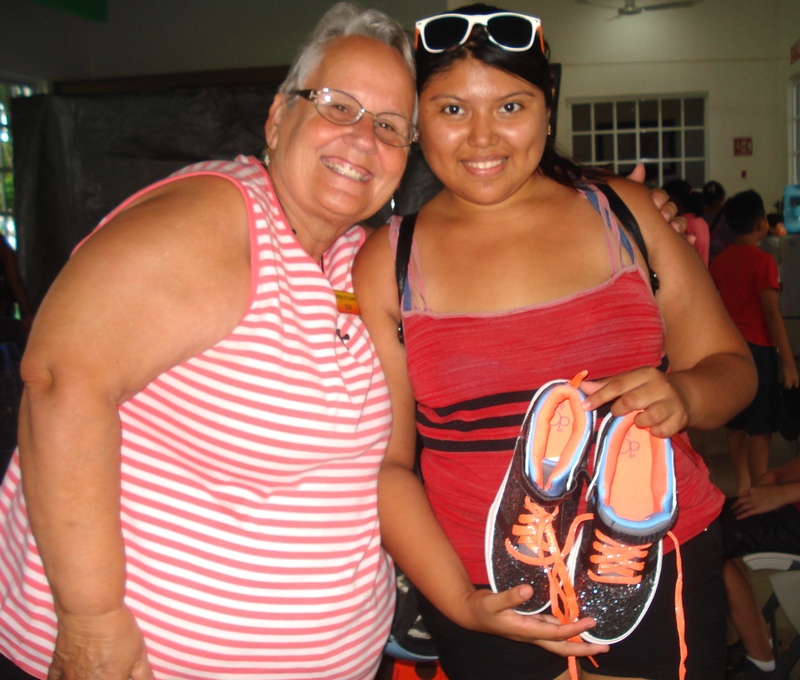 Volunteer Ilene (left) earned a smile by fitting this student in shoes with a little sparkle. But how can a simple pair of shoes help students go to school? The fact is that each student must have a pair of black shoes for their uniforms as well as a pair of athletic shoes to go to school. On an island where rubber flip-flops are the typical footwear for many people, acquiring two pairs of shoes can be daunting. Friends of Cozumel focuses on supplying athletic shoes and accepts donations of new pairs in all sizes. Cindy (right) is a FOC scholarship recipient and volunteered to help fit shoes on younger kids. The effort to get children into schools appears to be working. 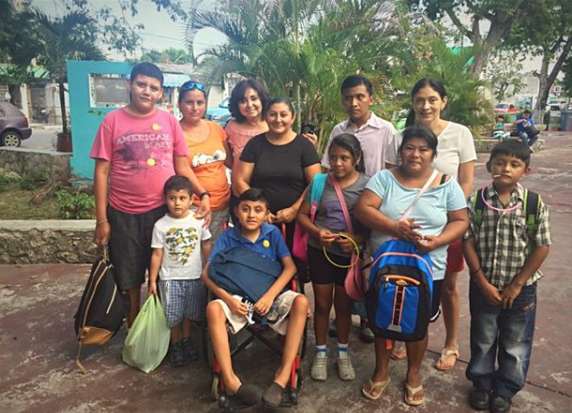 Many of the older students who have relied on Friends of Cozumel’s support for years have stayed in school. Now they’re paying it forward by as young community leaders at FOC activities. 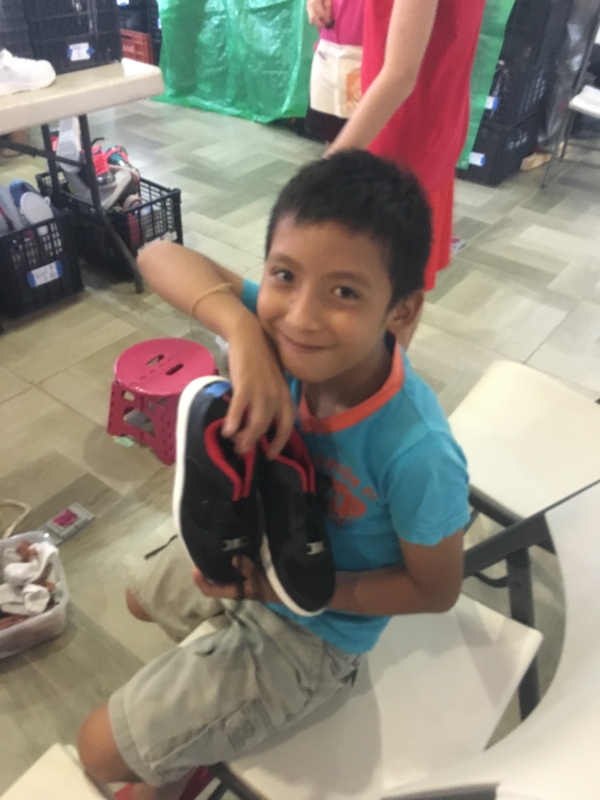 Getting a new pair of shoes made his day. Today the volunteers worked to fit a group of special needs children with shoes. One giggling young boy couldn’t have been happier with his shoes. Lights in the soles blinked each time he took a step. His smile was just as bright as his shoes. Kudos to all our 2017 shoe donors, including the CREW team that donated and delivered more than 300 pairs of new shoes. Regardless of the shoe style, all of our donors have brought soles that light up the faces of children in need. This entry was posted in Uncategorized on July 30, 2017 by pedersenll. People arrived early and waited patiently for school supplies. Outside of the Parke DIF’s beautiful senior center facility, people patiently stood in line with their children. They were waiting for an opportunity to acquire school supplies required for their children to attend school. Each school has a specialized list of personal learning materials, athletic shoes, school uniform and basic classroom supplies that students must supply. 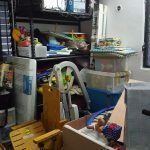 The backpack, paper, notebooks, folders, pencils and pens, erasers, sharpener, ruler, calculator, crayons, highlighters and markers, scissors, correction fluid and geometry sets would cost some families with limited resources a week or even a month’s salary. Multiply that financial hardship by the number of children in the family and a difficult situation becomes an impossible one. That’s why Friends of Cozumel began to offer help nearly 10 yeas ago. 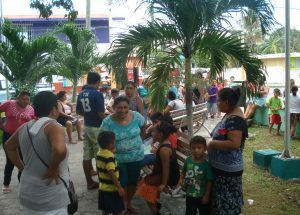 Prior to the 2017 mission week, hundreds of families met with Friends of Cozumel coordinators to review their financial need and register for assistance. 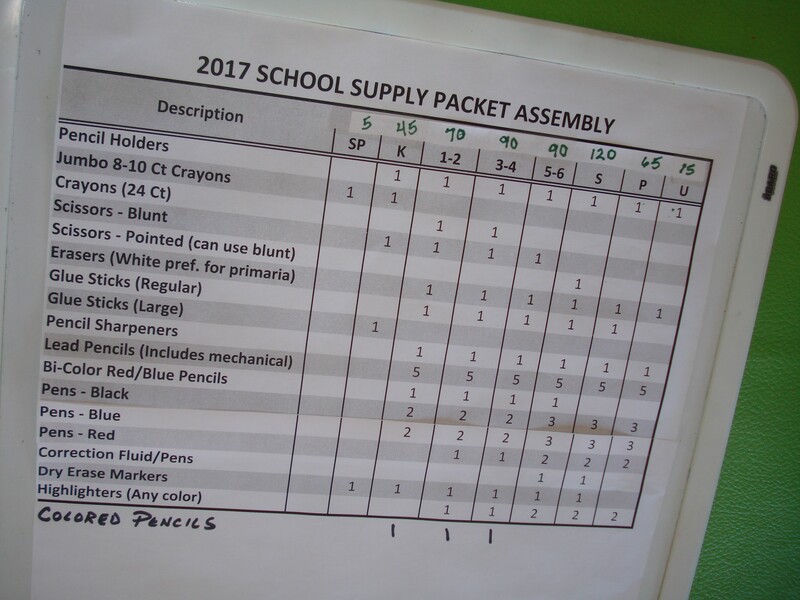 What started as a modest program to help a few children, has now grown to the biggest school supply distribution ever attempted by FOC. This summer 495 children are registered. Stacks of donated backpacks and other supplies were ready for them—thanks to the generosity of so many supporters. 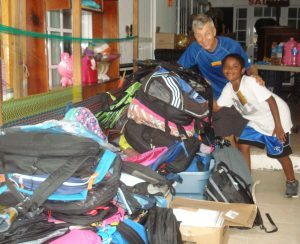 Larry (left) and Braylon check out the supplies of backpacks. 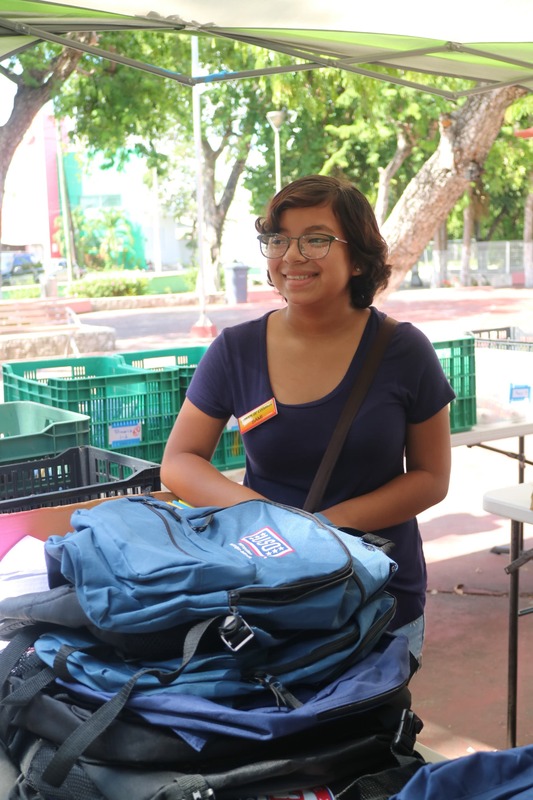 A group of divers with the Worldwide Christian Scuba Diver Organization joined other FOC volunteers to help get the right supplies into the hands of primary, secondary, high school and university students. “It’s gratifying to see the excitement generated here,” said Steve from Minnesota. Deborah (left) enjoyed her experience as a first-time FOC volunteer. 1. Shop the U.S. school supplies sales going on right now. Click here to see a list of needed supplies. 2. Click here to learn how to make a monetary donation. Thank you. Your help will create lots of smiles. This entry was posted in Uncategorized on July 29, 2017 by pedersenll. Dozens of volunteers attended a planning and orientation meeting in Cozumel this week to prepare for Friends of Cozumel’s summer mission week. It’s one of three missions that takes place each year. The goal is to execute a number of projects focused on education as well as strengthening families and the community. 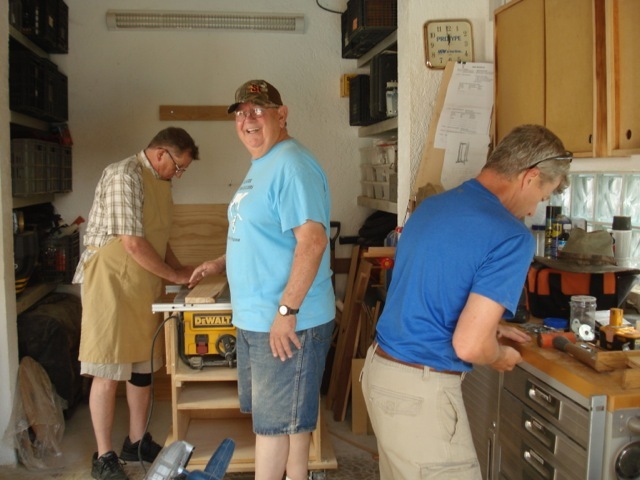 This summer’s FOC volunteers are a diverse group of nearly 50 people. Some have been volunteering with FOC for years; others are experiencing Mexico for the first time. Some live right here on the island; others come from Delaware, Maryland, Texas, North Carolina, Nebraska and Iowa as well as Merida and Valladolid in Mexico. Ages range from 13 to “don’t ask—it’s well beyond 60.” Some are English speakers, others speak only Spanish and some use both. 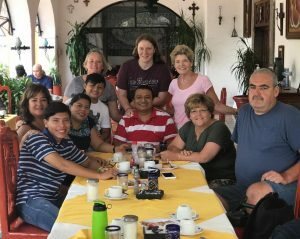 Some join the effort as individuals; others are part of a group like the 11 visitors from the Worldwide Christian Scuba Divers Organization. Some represent a church and others don’t. And a few start many weeks in advance to make preparations while others have only one day available to volunteer. 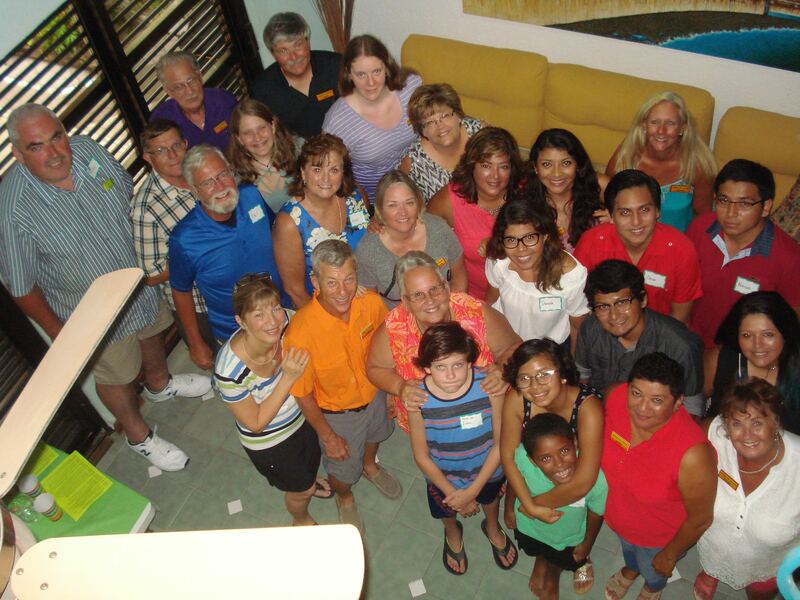 Friends of Cozumel volunteers are ready to begin their work. Despite their differences, all FOC volunteers have one thing in common: a commitment to service. Veteran volunteer Byron from Texas knows what to expect. “It’s going to be hot and there’s always the language barrier, but that all falls away once you get into it,” he said. We’re gearing up for hard work, long hours and sweaty situations, hoping it will result in a positive and lasting impact. Check back here in the next couple of weeks. We’ll share the progress of these projects with you. This entry was posted in Uncategorized on July 27, 2017 by pedersenll. Dramatic makeovers are not just limited to reality TV shows. 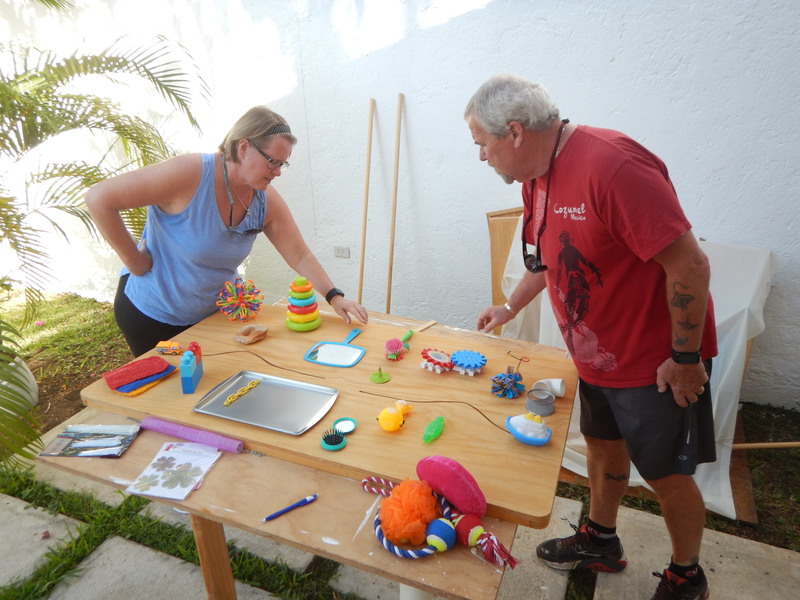 Friends of Cozumel (FOC) volunteers transformed a “bodega” storage space into a sensory therapy room for special needs children served by Corazones Unidos (means United Hearts). 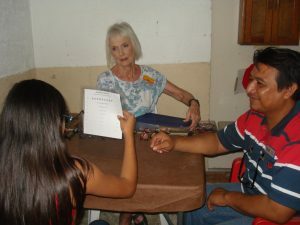 The therapy center was previously known as “Casita Corazon”. It was founded by Carrie’s Heart, a nonprofit 501(c)(3) organization based in Houston, Texas dedicated to improving the education, community involvement and overall quality of life of children with disabilities worldwide. Corazones Unidos is now an independent Mexican “civil” (non-profit) organization that serves 8-12 youth, some of whom are severely impacted by multiple disabilities. Therapists work as a team with family members to provide therapy for the children three times a week. 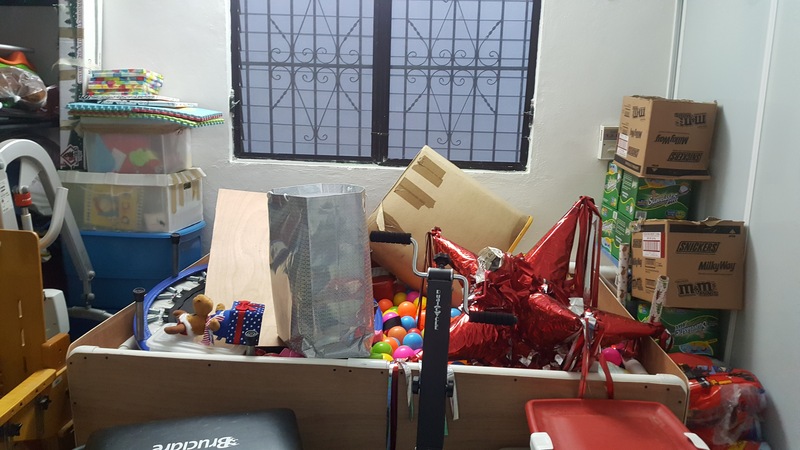 Carlos, lead therapist, met with FOC volunteers to share his vision of transforming a disorganized storage area you could hardly walk through into a multi-use sensory therapy room that includes a gym, sensory board and light therapy. 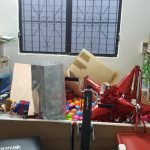 The team had a daunting challenge but jumped into the process by cleaning out and organizing items stored in the room, designing the room layout, acquiring materials needed, constructing and installing the therapy equipment. 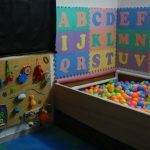 A Ball Therapy Pit was located in the corner surrounded by foam mats with letters in bright colors and extra padding installed to protect the children from sharp edges or corners. 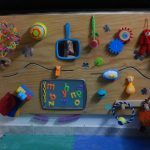 The Sensory Board mounted under the window was created using a wide array of colors, shapes and textures for children to feel and experience. A “lap top” sensory board was constructed using common hardware items (slides, latches, knobs, etc.) to further develop children’s fine motor skills. Special “black out” curtains were made for the windows. Black lights will be utilized for special light therapy sessions. 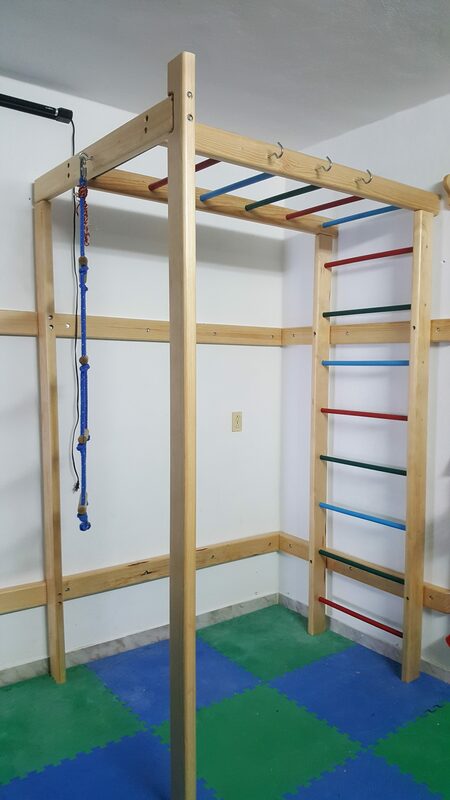 The gym design containing a hanging ladder, overhead bars and hanging balance swings was inspired from an idea Carlos found on Pinterest. The therapy team is excited to put these new tools to work with the children. Many thanks and congratulations to the team of volunteers who contributed their time and talent to make this transformation a reality: Sandy Ham, team leader, with volunteers Mike and Hettie Legg, Lee and Dianne Wilson, John Killoran, Paddi Davies, Larry Pedersen, and Ilene Kendrick. This entry was posted in Uncategorized on February 26, 2017 by pedersenll. 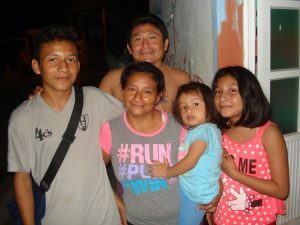 Cristina’s family (from left): Manuel, Christina,Victor, Evelyn and Behlen. Cristina is deaf and communicates using her own system of signs. 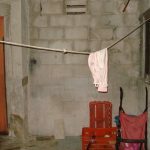 She and her spouse Victor live with their three children in a neighborhood of families with limited resources. Unfortunately, their house had no means to secure the windows or doors, allowing thieves to rob the family of their meager possessions. 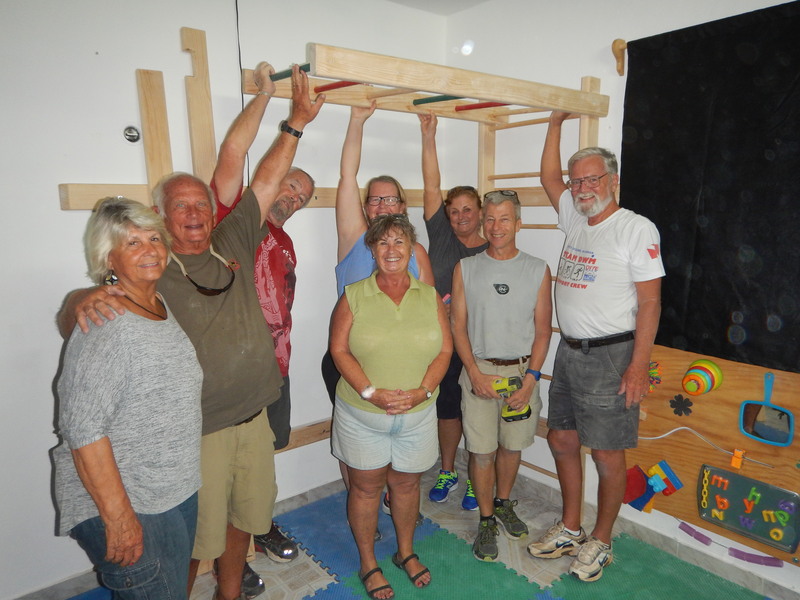 A small team of Friends of Cozumel volunteers visited their home to learn how they could help. “We’re very excited to come along side this beautiful family,” said Shelley, a returning volunteer from Minnesota. 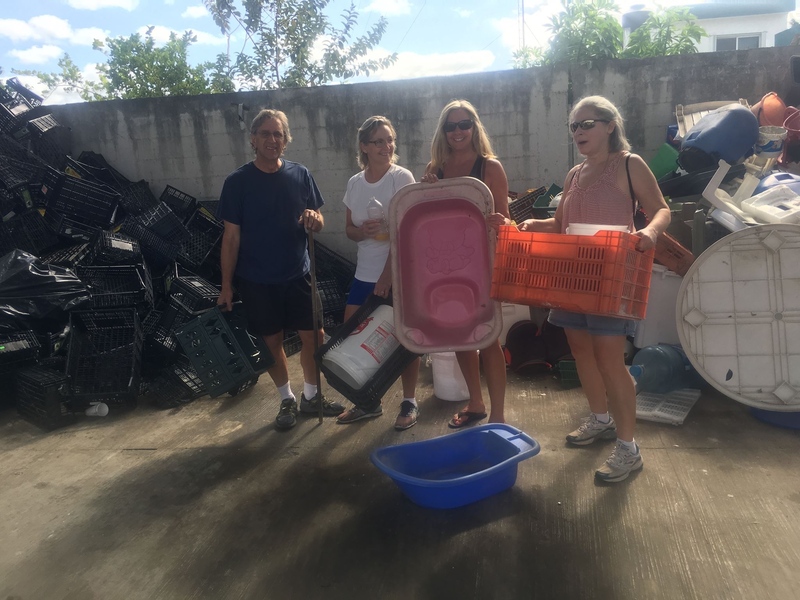 Volunteers went to the recycling center, finding things to repurpose for the family. The house has no heating, air conditioning or plumbing. The bathroom has two, five-gallon buckets filled at an outdoor hydrant. One is used for bathing and washing dishes. They other is used to flush the toilet. Their furniture consists of a bed, hammock and two plastic chairs. Only one fork, two plates and a couple of pots blackened from wood-fire cooking remained in the small collection of kitchen items. Nonetheless, it’s a happy home. 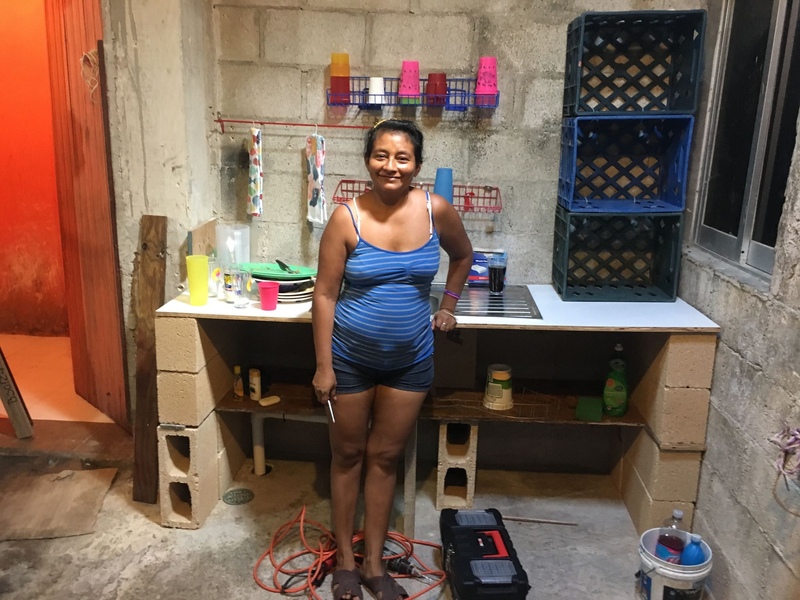 Cristina has made the best of their resources despite the limitations. “In meeting Christina’s family, what stood out to me is the love and care shown, especially between the young sisters,” said David from Minnesota. “It was beautiful. I feel honored to help this family create a safer, more functional home. 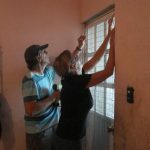 David and Shelley install window security mesh. To create a safer home, window security fencing and door locks were installed to prevent break-ins. Dangerous electrical wiring was also repaired and lighting was added in the room used as a kitchen. Functionality was improved by constructing two countertops with easy-to-clean laminate. One was for food preparation and cooking on a single burner hotplate, and the other surrounded a new stainless steel sink where water could be carried in and then drained after use. 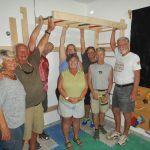 Shelves were made from reclaimed materials from the recycling center and stocked with enough plates, silverware and cooking utensils for the entire family. The finishing touch was a gently used refrigerator, dining table and chairs donated by generous FOC supporters. Before: This area had a drain in the corner–a perfect place to put a sink. 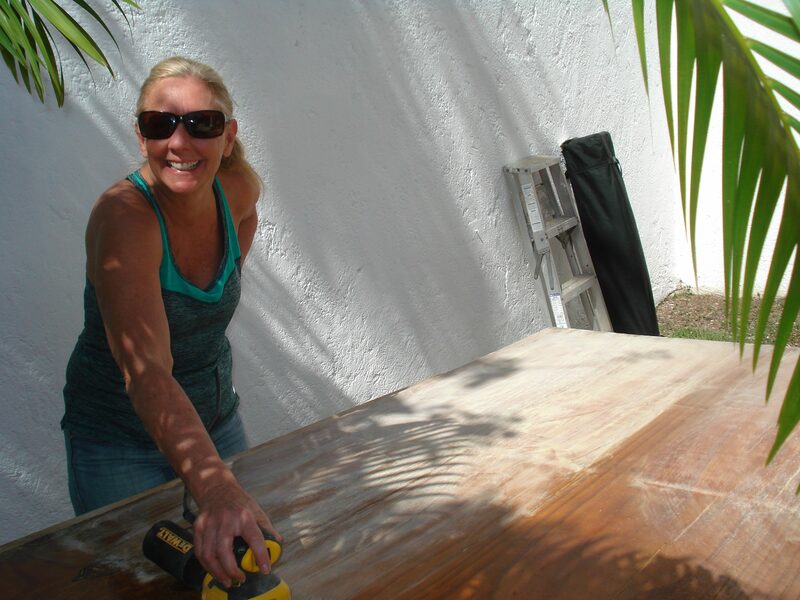 After: Cristina is delighted with the sink, countertop and recycled shelving. For the first time, the family of five could sit together around a table for their meals. But the first meal at that table included more than just the family. 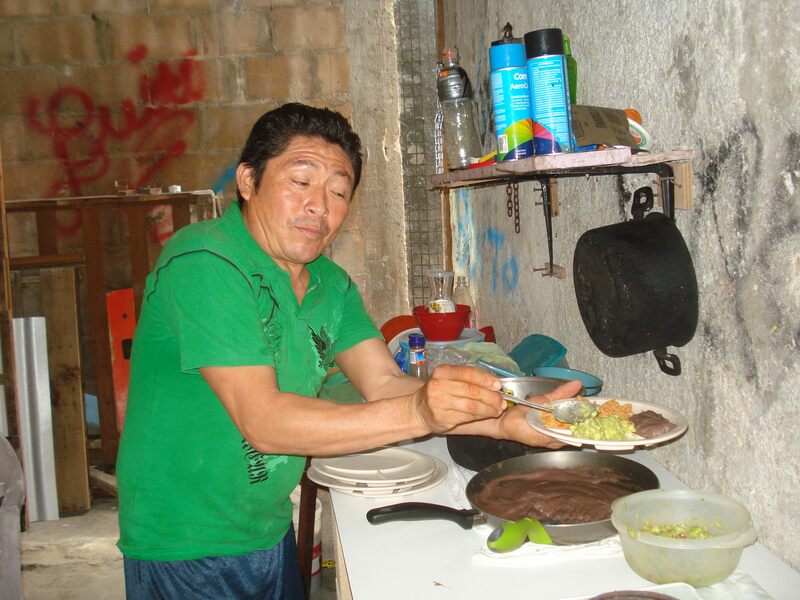 Victor uses the new cooking surface and utensils to create a special breakfast. The breakfast included a traditional beverage of horchata, guacamole, tortillas, refried beans and heaping servings of a savory pork dish seasoned with gratitude. Cristina and Victor’s family gave FOC volunteers an opportunity: to problem-solve, to give reclaimed materials a second life, and to cope with language limitations—both our own and Cristina’s. But perhaps the most valuable opportunity was to be engaged with this family to build a sense of pride and connection for everyone involved. Breakfast with the family was a celebration of all we’d accomplished together. 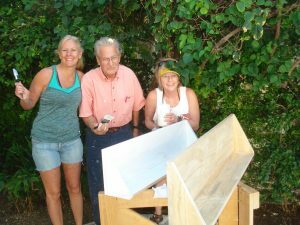 (from left) Phyllis, David, Shelley and Gary apply adhesive for the countertop. 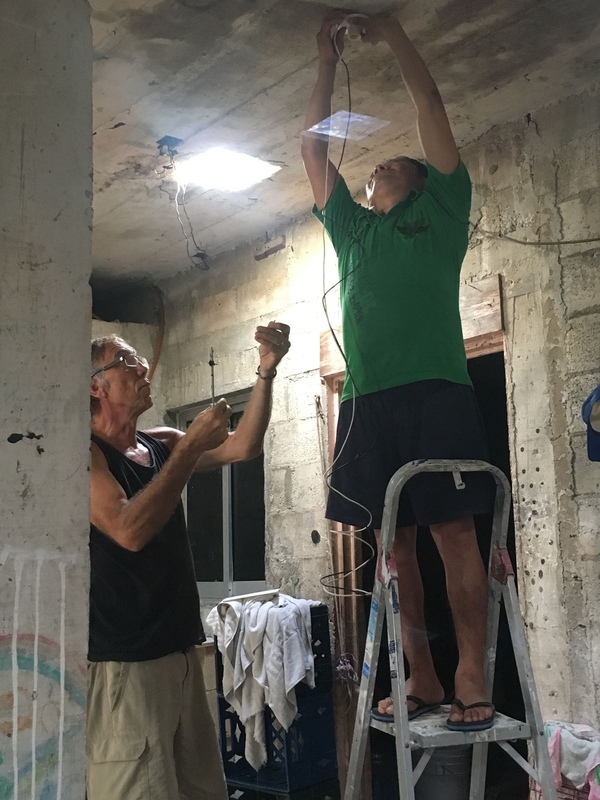 John (left) and Victor work together to install a light. 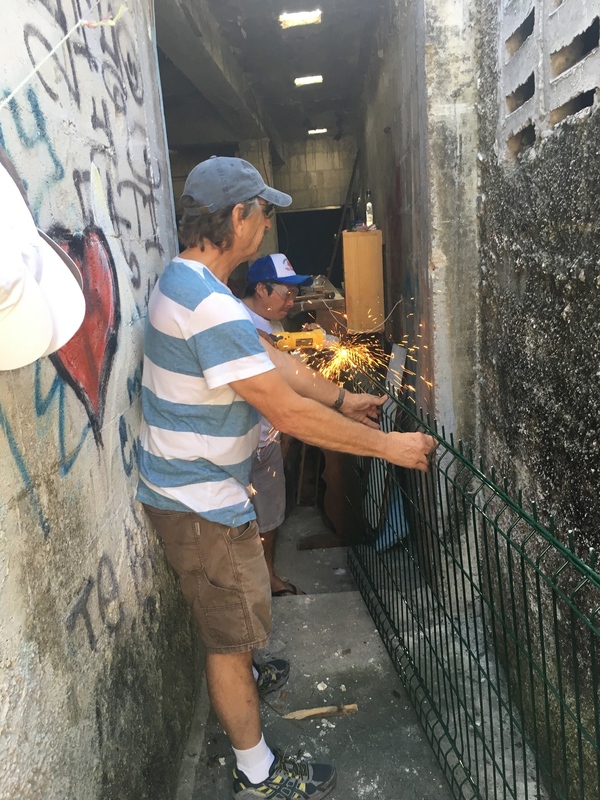 David (left) and Victor use a grinder to create a security door for part of that house that was open to the alley. 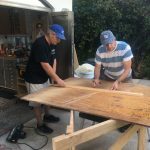 Gary (left) and David measure wood for the countertop. 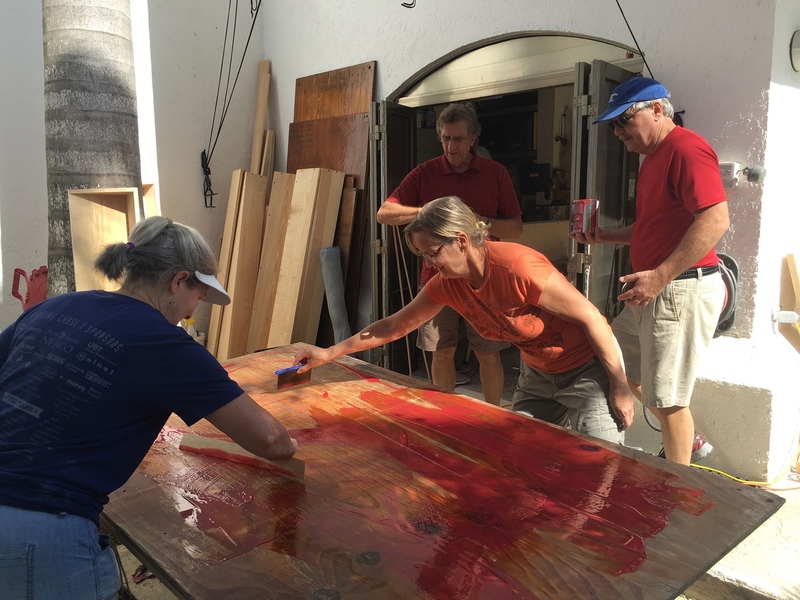 Kristin sands the wood for the countertop. 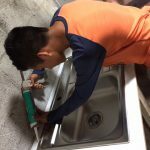 Cristina and Victor’s son, Manuel, learns to use the caulking gun. This entry was posted in Uncategorized on February 5, 2017 by pedersenll. The Gran Bazar drew a good sized crowd of shoppers. Fifteen minutes before the scheduled time to load the 13,783 items (give or take a few) for the Gran Bazar, the skies opened up and dumped a deluge. 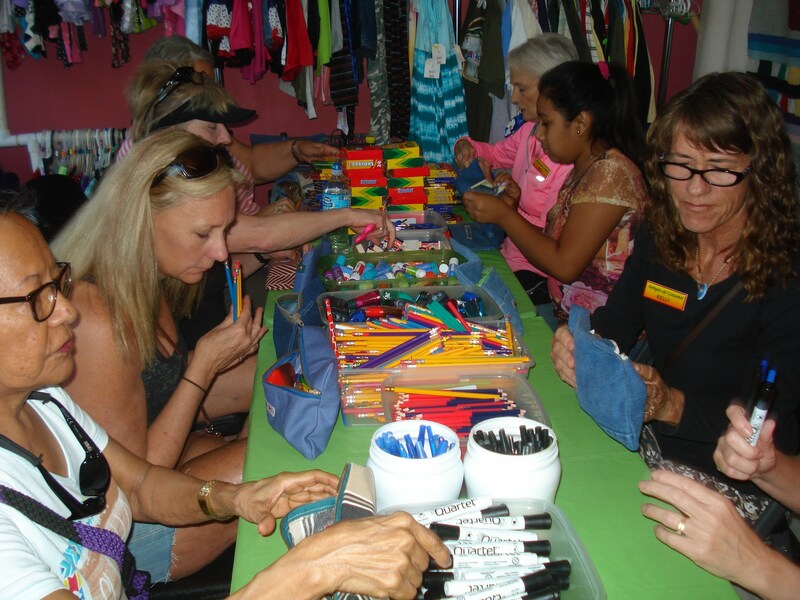 Friends of Cozumel volunteers had spent hours, days and months preparing for the twice-yearly yard sale. They were ready to transport dozens of suitcases and plastic crates to where hundreds of people were expected to show up. But when the rain comes, the streets flood and people stay home. And the place where the sale was to take place is an outdoor church with only a partial covering overhead. Uh oh. Problemo. A few minutes later, the clouds began to move and Maria, a local volunteer, said “Es cambiado. No habrá más lluvia.” It’s changed. There won’t be any more rain. Volunteers made the Gran Bazar a fun experience for kids. Despite the puddles, yesterday’s Gran Bazar went off without a hitch at Vida Abundante Church. Some of the donated clothing, shoes and household items were new and some were gently used. 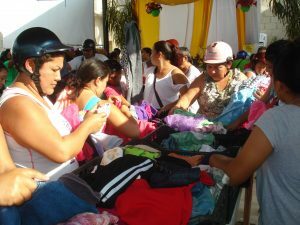 Prices were kept low to help families that only have a few pesos to spend. 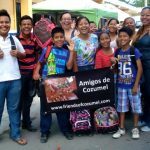 Then proceeds from the bazar are used to support Friends of Cozumel projects, scholarships, and churches serving families with limited resources. “No matter how many times I do this, it never ceases to amaze me how big the crowd is and how they rush to come in when we open,” said Kristin, a returning volunteer. 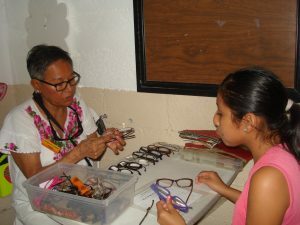 Volunteers Rita (center) and Pastor Salomon (right) helped fit reading glasses. Tania (left) helped a young woman find the right strength of reading glasses. While some volunteers helped with sales, crowd control or entertaining the children of shopping parents , others worked with adults to fit them with donated reading glasses. 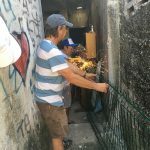 The goal was simply to connect with people who need some of the things we could easily provide. This entry was posted in Uncategorized on February 3, 2017 by pedersenll. 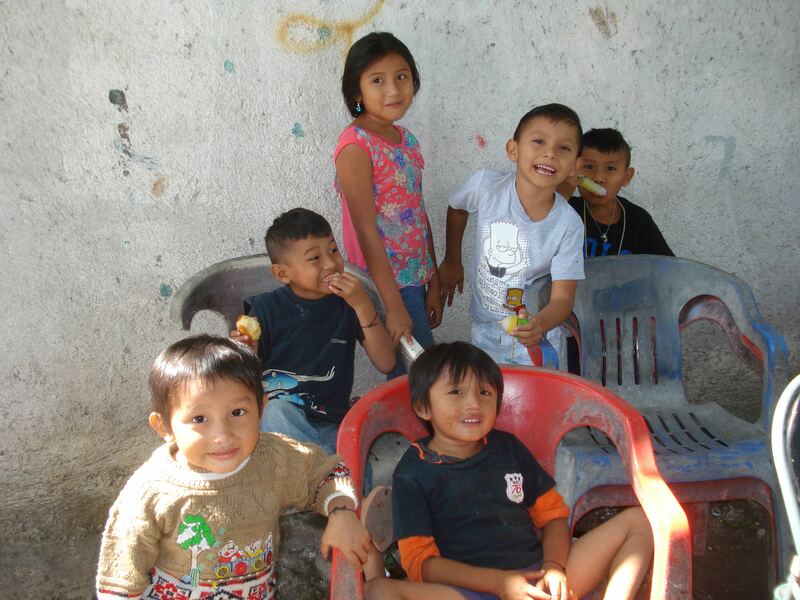 Children playing near the worksite were anxious to greet the gringos. 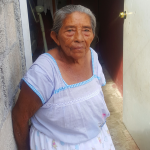 Facunda is the matriarch in a large family where she helps care for the children. Cooking over a wood fire is a novelty that we might enjoy occasionally when camping. But imagine cooking that way every day, rain or shine, for a large group. That’s what Senora Facunda does. Facunda is an 82-year old Mayan grandmother. She’s the matriarch in an extended family living in a group setting that includes 15 children and several adults. Facunda’s outdoor cooking area includes a cement floor, a grate over concrete blocks and a couple large pots, blackened by the fire. 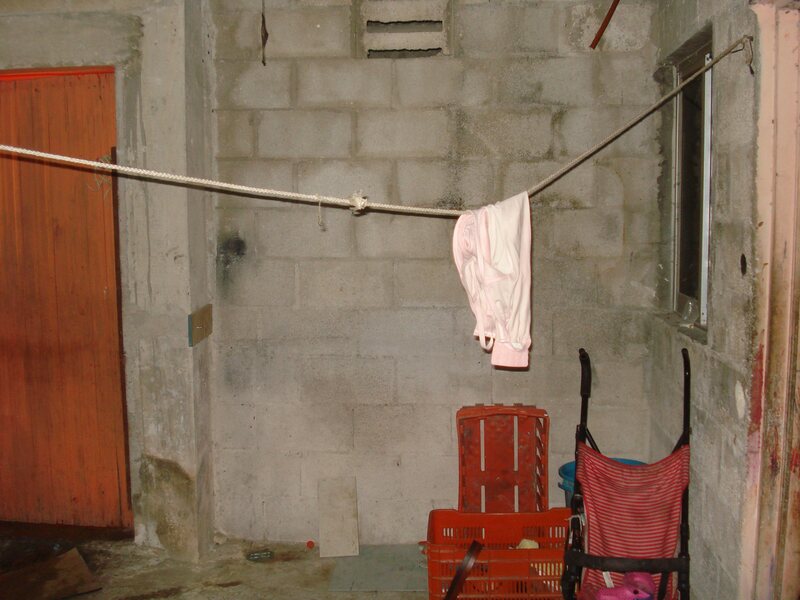 She struggles to keep her kitchen functioning throughout the hurricane season’s wind and rain. When the fire goes out, there’s no food for the family. Lamina sheets (foreground) were used to protect the outdoor kitchen of the family group living here. 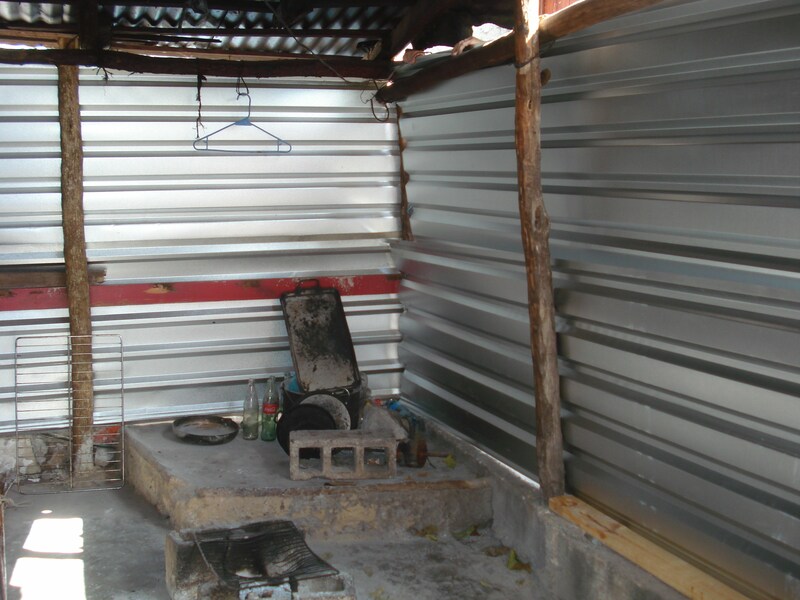 Friends of Cozumel volunteers offered help to Facunda by purchasing lamina—tin roofing material—to surround her kitchen area, protecting it from the elements. They also installed overhead lights in the kitchen and near the room where she sleeps. 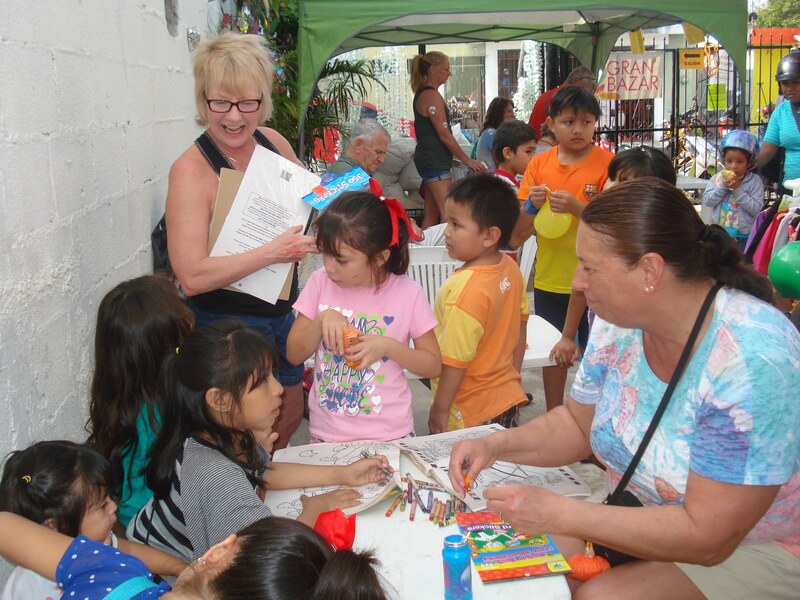 The children were excited to try out their English hellos when the FOC volunteers (los gringos) arrived. 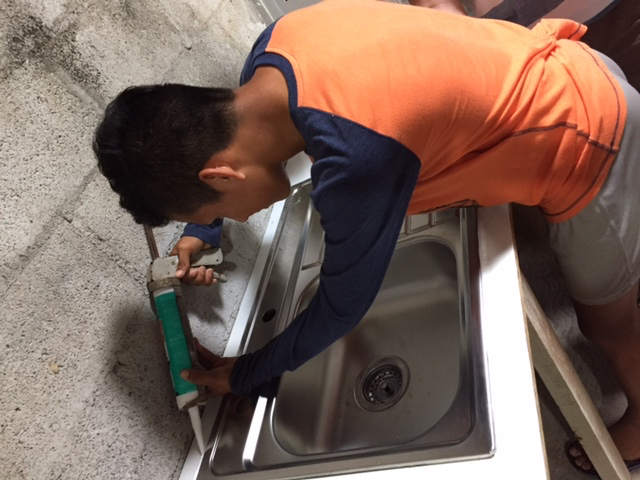 As the tin was installed, the kids covered their ears to soften the noise of the grinder’s cutting wheel and the drill. After: FOC volunteers enclosed Facunda’s outdoor kitchen. Before: Facunda’s kitchen was open to the elements. This entry was posted in Uncategorized on February 2, 2017 by pedersenll. 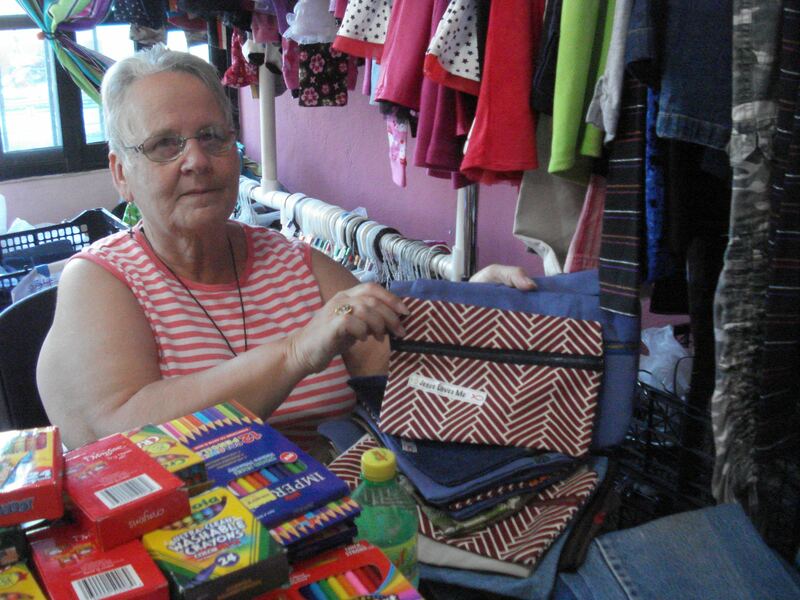 Charo’s family is grateful for donated school supplies. Each year, the demand for help in accessing school supplies seems to increase. Many families struggle supply the required materials in order for their child to attend school. What began as a modest effort to help a few dozen families send their children to school has now grown beyond 500 students. And what started as the need for a few extra pens, pencils and markers has now grown to thousands. 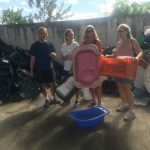 That means Friends of Cozumel volunteers must begin months in advance of the July distribution time to gather, sort and assemble the necessary supplies. 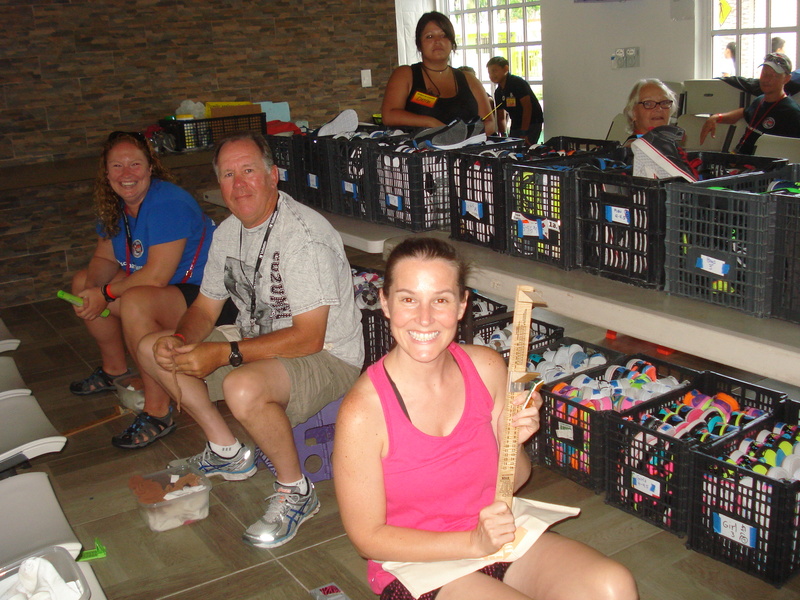 Local FOC volunteers work alongside visitors to sort school supply donations. A group of 10 resident and visiting volunteers gathered recently to help begin the sorting process. 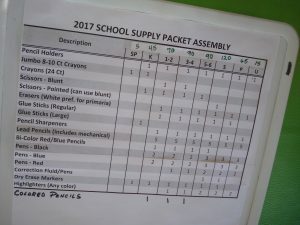 They followed lists in an assembly line that sorted writing utensils, erasers, highlighter, scissors, and more into handmade pencil bags according to the grade level requirements. FOC volunteers made the zippered pencil bags from recycled denim and other fabric scraps. Some of the bags were also made by local people learning to sew. After about three hours, the 10 FOC volunteers had filled 350 of the pencil bags. Then the momentum stopped. 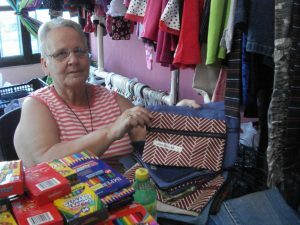 Ilene shows one of the many pencil bags she and other volunteers made. Larry, FOC leadership team member, explained that donations are still being accepted and that we hope to have enough to serve 500 students, kindergarten through university, come mid-July. Each grade level requires a different set of learning materials. This entry was posted in Uncategorized on February 1, 2017 by pedersenll. This place that many call paradise, is a feast for the senses. (from left) Kristin, Ray and Lori paint shelves as part of the construction project. 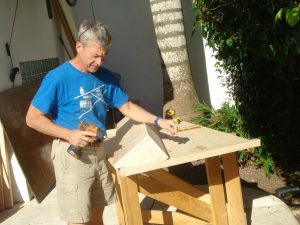 The tropical sounds of wind in the palms and unfamiliar birds mix with the din of electric sanders and a table saw. 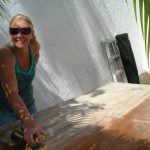 Rather than a smell of coconut oil on the beach, we can smell sawdust and adhesive used to create a laminate counter top. And though there’s a clear blue body of water near by, no one is jumping in to cool off. Not yet anyway. Instead, highly skilled volunteers work alongside others with only a hint of construction experience. They sense progress in their work for a variety organizations and individuals in need. 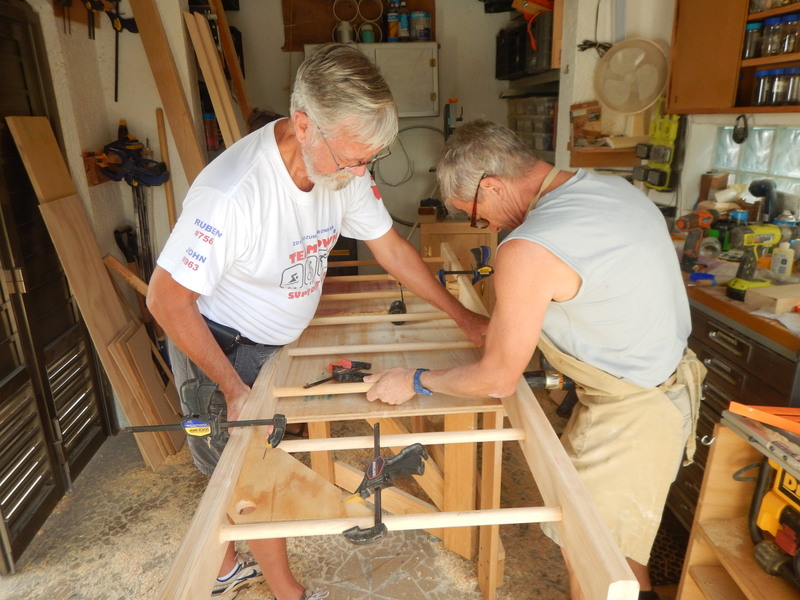 One project is to construct 32 sturdy wooden shelves to hold educational materials in classrooms and offices. 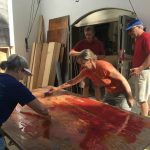 After cutting, assembling and sanding the local pine lumber, the shelves were coated with several coats of fast drying enamel paint to protect them from the extreme humidity of the island. Jerry and Ray built all of the shelves that will be used for educational materials. Larry is doing some final sanding and preparing for painting. 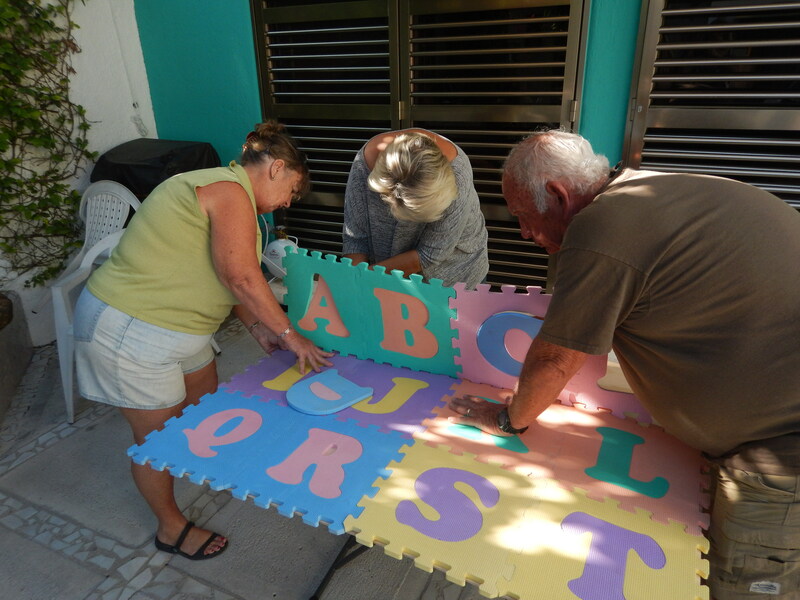 The finished shelves will be installed at the CAM schools (Centro de Atencion Multiple), CRIM (Centro de Rehabilitación Integración Municipal), and Centro de Autismo—all organizations that provide education and therapy for children and adults with disabilities in Cozumel. 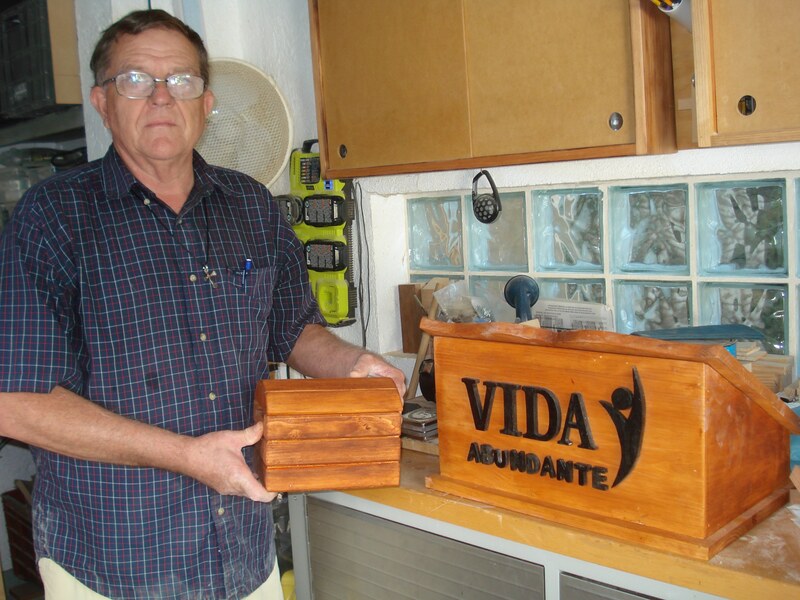 Byron took on an individual project of a lectern and offertory box for a church. 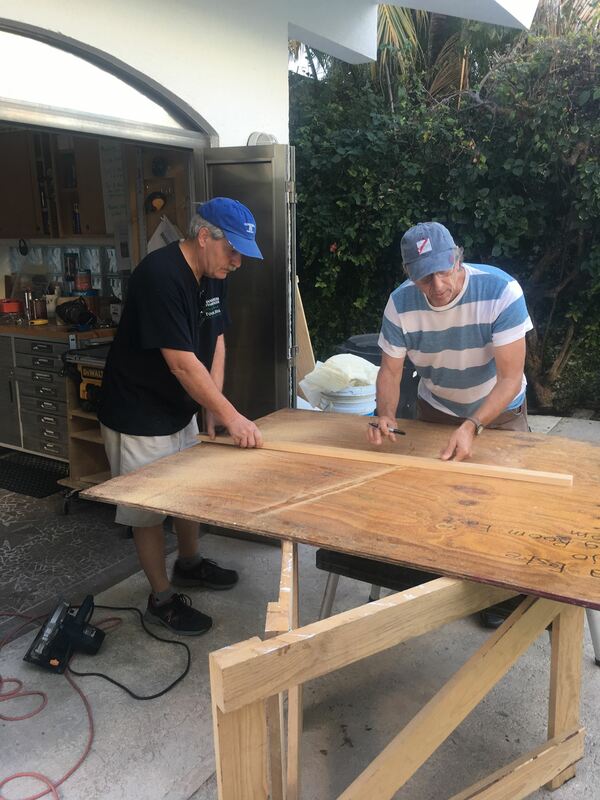 Byron is also working on an individual woodworking project of a custom designed table-top lectern and offertory box for Vida Abundante church. Hours and hours have gone into the project. 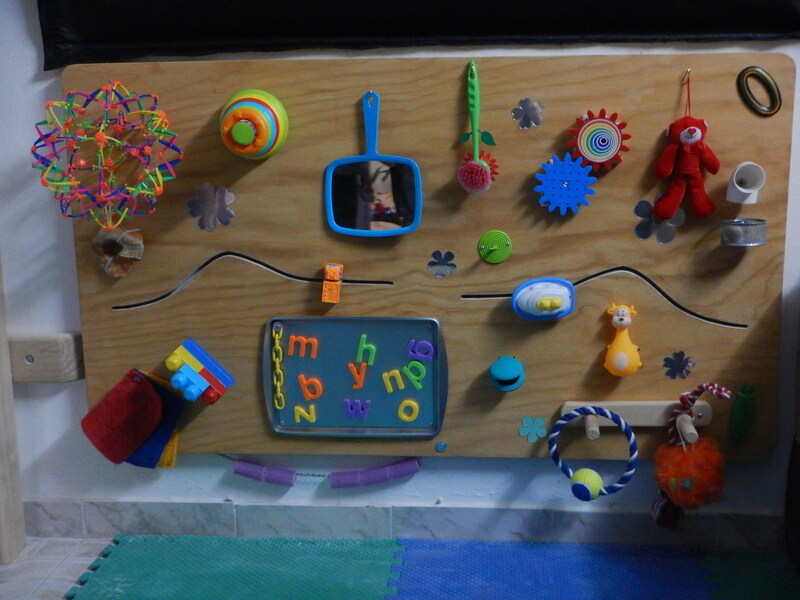 Volunteers will continue their construction work on projects such as a sensory therapy board. Children at Corazones Unidos will use the board to feel various shapes and textures—perhaps creating their own sense of progress. This entry was posted in Uncategorized on January 31, 2017 by pedersenll. 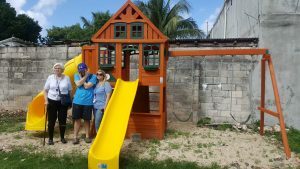 The 30 or so children who come to the Centro de Autismo in Cozumel have a new place to call their own. It may look simply like a cool place to play, but it also extends the therapeutic options for children living with autism. Autism affects brain development and may cause difficulties in social interaction, motor coordination and communication. Therapy often includes behavioral work in social and play skills and opportunities to interact with peers. And what better place to conduct that therapy than in a colorful setting of swings, slides, and climbing structures ripe for exploration and interaction? Playground equipment donors stand in the space before volunteers prepared it for use. 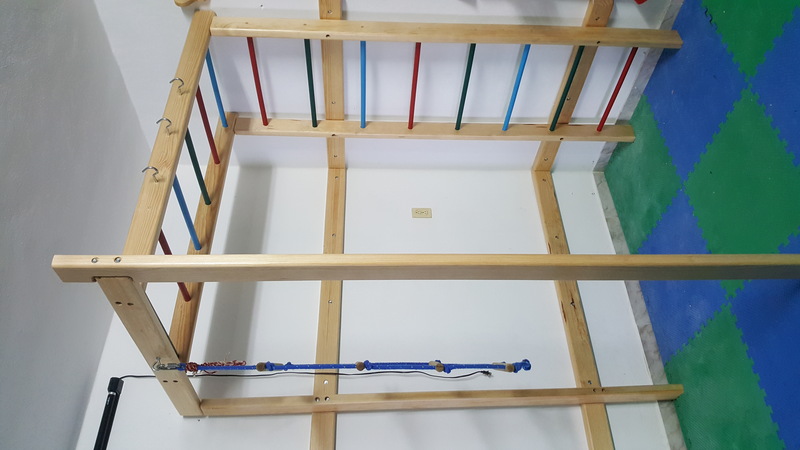 A playground set was recently donated to Centro de Autismo through Blue Skyes Over Autism, a nonprofit organization in Houston, Texas that provides support and education to families living with autism. 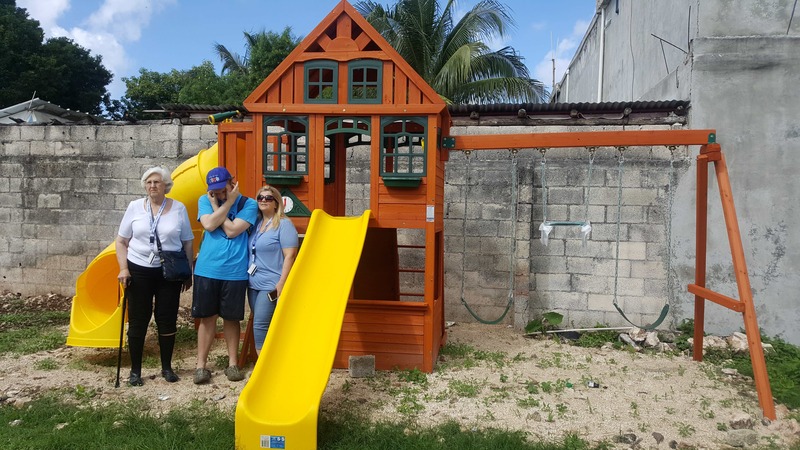 But before the playground could be put to use, a safe space had to be created for it. And it was going to require a lot of hot, sweaty work. That’s where Friends of Cozumel and 10 youth volunteers from Vida Abundante church were able to help. They did all the work by hand, yanking weeds out by the roots and spreading gravel with shovels. It was all part of a goal to continue involvement by local youth and adults in serving others through FOC projects. 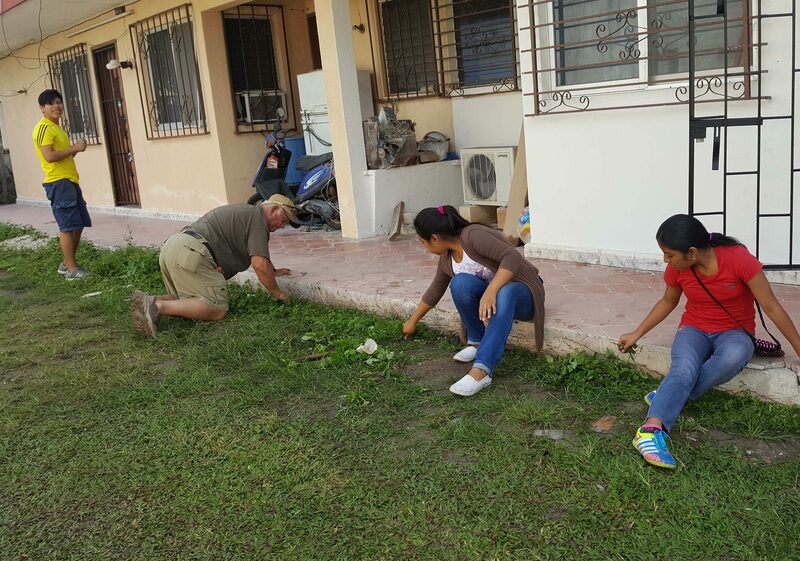 After the outdoor space was cleared of rocks, weeds and debris, the surface was smoothed out. Then a fine gravel base was spread under the playground equipment. Plants were trimmed and soon the area looked like a well-manicured park. Lee (on knees) helps local teens with their service project to prepare the playground space. Lee, a returning FOC volunteer from Alabama, did his share of hauling rock, too. Teen volunteers helped FOC prepare a great space at Centro de Autismo for play therapy. This entry was posted in Uncategorized on January 28, 2017 by pedersenll. Perla (left) gets sewing advice from FOC volunteers Marion and Tania. Now the time had come to launch that idea. 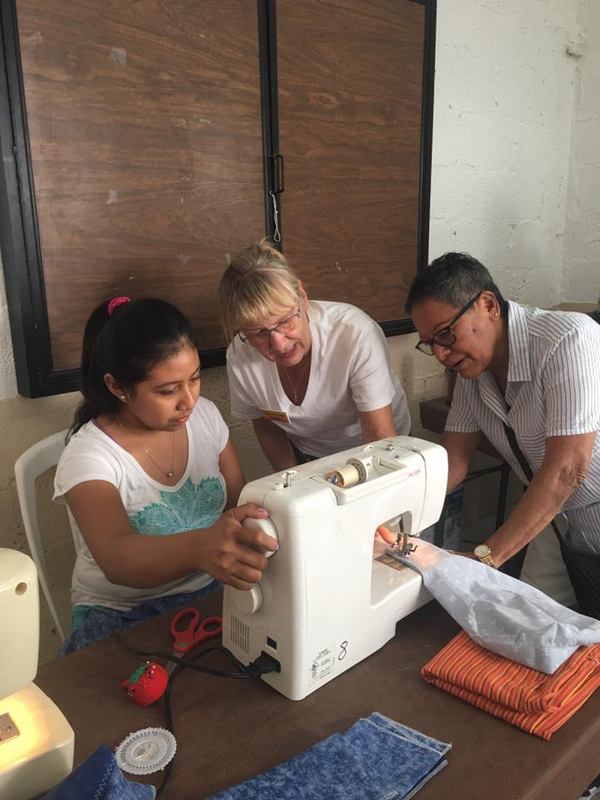 Our volunteer team serviced the sewing machines donated previously to Friends of Cozumel, measured the donated fabric brought from the U.S., cut out and surged all of the pieces and then took them to the church. The participants for yesterday’s workshop were to be people with some sewing experience because the goal was to produce costumes for the church, rather than teaching basic sewing skills. 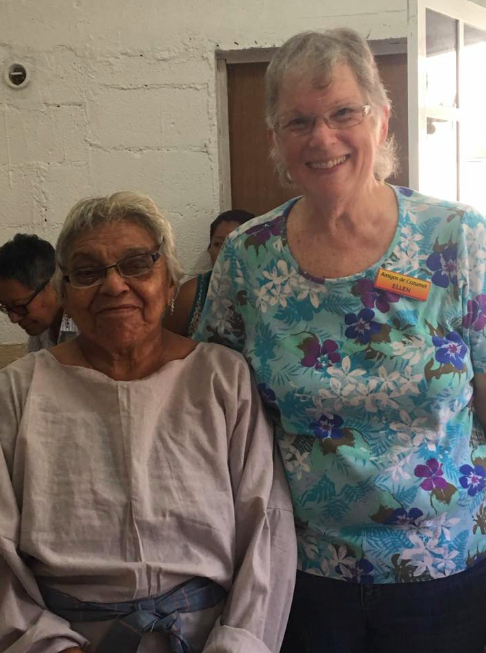 Rita (left) had never used an electric sewing machine, but FOC volunteer Ellen helped her learn. At the first of our two-hour sessions, we had seven participants. One lady had never sewn before and another had never sewn on anything but a treadle machine. “I’m so nervous, I’m sweating through my clothes,” said a workshop participant named Martha. We were fortunate to have the assistance of Elena, a local sewing teacher, who learned to sew in some of FOC’s very first sewing classes several years ago. She helped our new seamstresses have a successful day, completing a vest and several belts. We had lots of fun with Rita who had never used an electric sewing machine. She had a hard time not moving her foot up and down, so the machine would barely start, then stop. Then when she would get started again, she had trouble getting the concept of taking her foot off of the peddle to make it stop. She never got discouraged and laughed and had the best time. We all had lots of laughs and everyone completed at least one item. 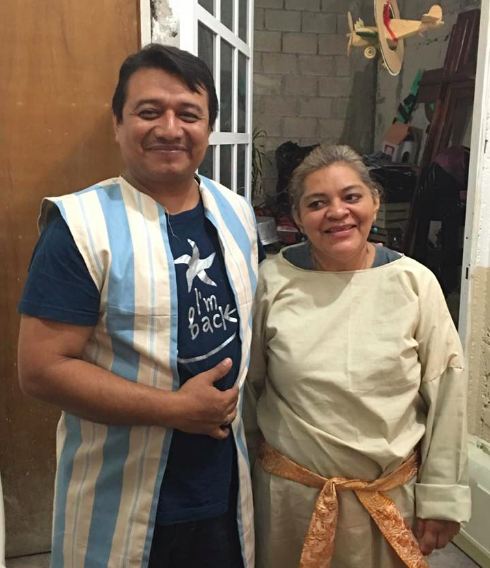 Pastor Salomon (left) and workshop participant Elena proudly show the completed costumes they made in one of the sewing workshops. cut out, but everyone worked hard and we completed everything we had prepared: 11 tunics, 15 vests and a whole bunch of belts. I came dragging in at the end of the day, but we were all so excited with what was accomplished. This entry was posted in Uncategorized on January 27, 2017 by pedersenll. 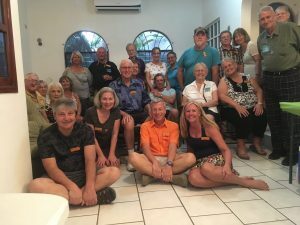 Nearly 45 new and returning volunteers have gathered in Cozumel, coming from down the block and across the globe. 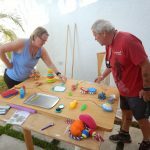 They’re about to begin work on a variety of projects for island residents in need that focus on helping organizations, families and individuals become more self-sufficient. • Mentoring local teens and adults in community service. Throughout the next 10 days or so, we hope to give you an insight to our experiences. Follow us on Friends of Cozumel’s Facebook page or on the web. We’ll look forward to your comments and encouragement as we combine our efforts to make a difference and have some fun. This entry was posted in Uncategorized on January 26, 2017 by pedersenll.